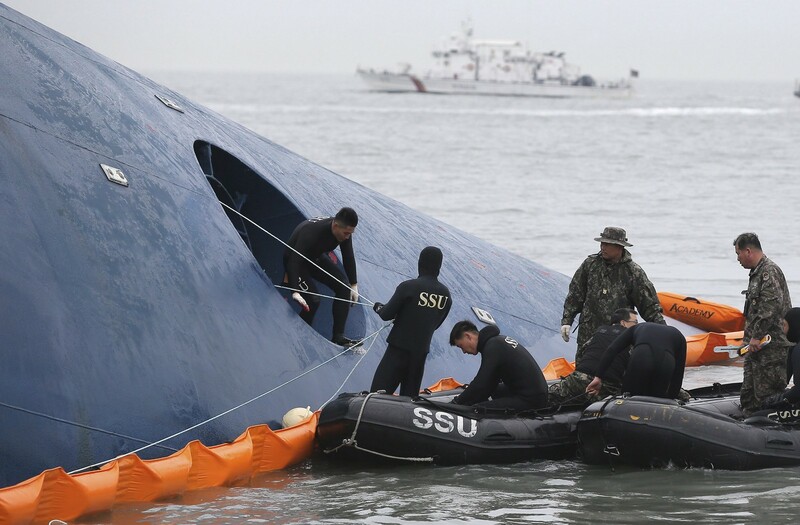 SINGAPORE - A mobile phone video obtained by Korean news website Newstapa captured students in their final hours, as they struggled on board the South Korean ferry that sank on April 16. 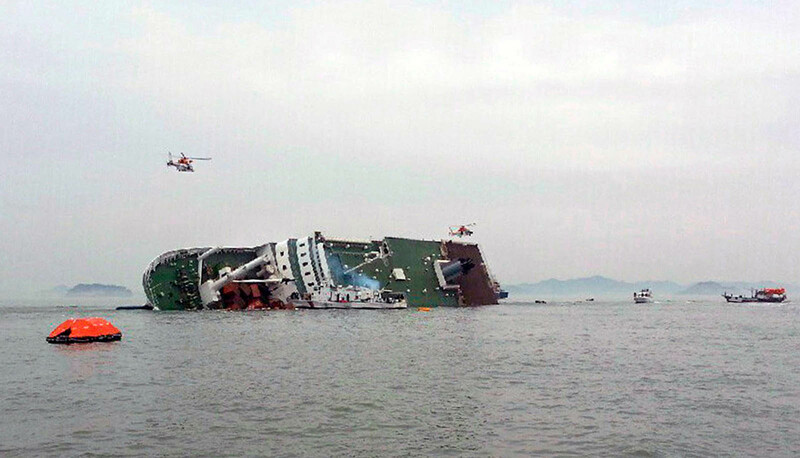 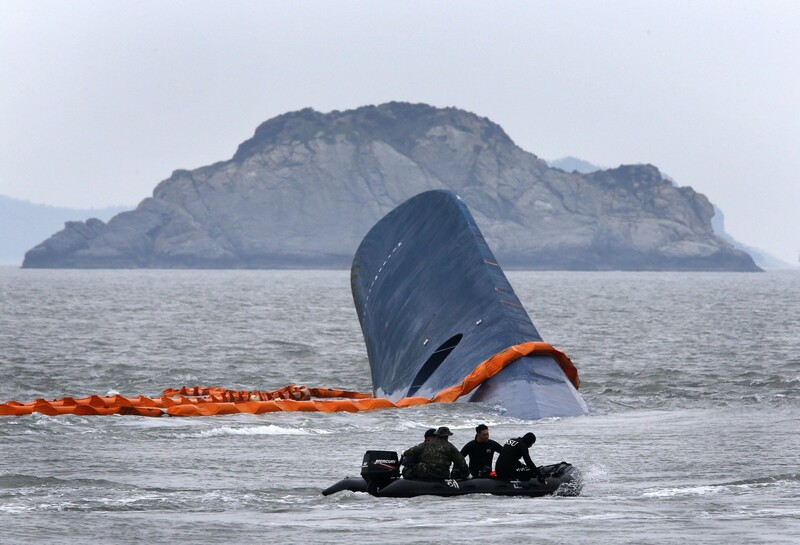 More than two weeks after the 6,200-tonne Sewol capsized and sank, 213 people have been confirmed dead but 89 remain unaccounted for. 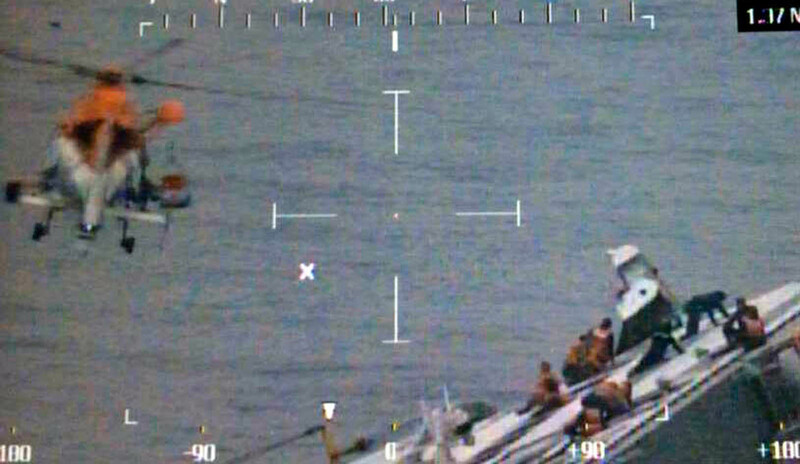 The New York Times' account of the video contains chilling pleas for help, confusion, attempts to cling to hope and final messages to loved ones. 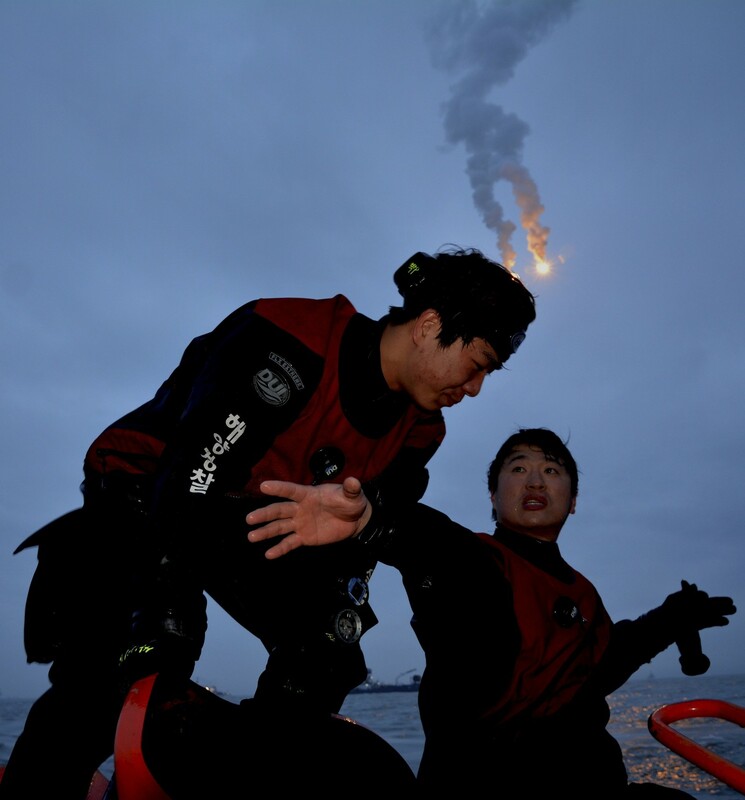 "Are we going to die?" 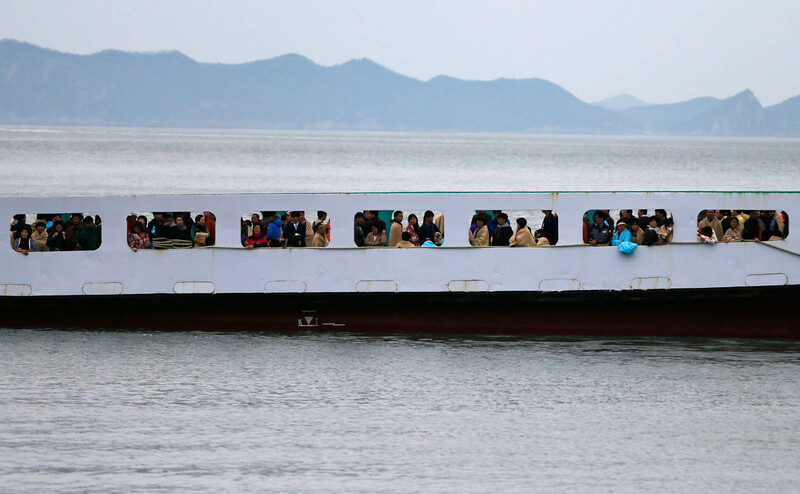 "Are we becoming a Titanic?" 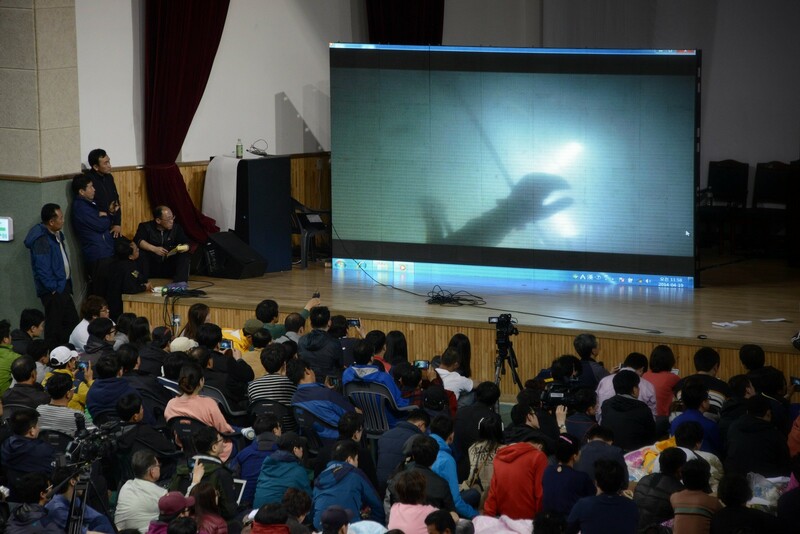 The video also contains voices of the crew on the ship's intercom, directing students and other passengers to remain in place and not abandon the sinking ship. 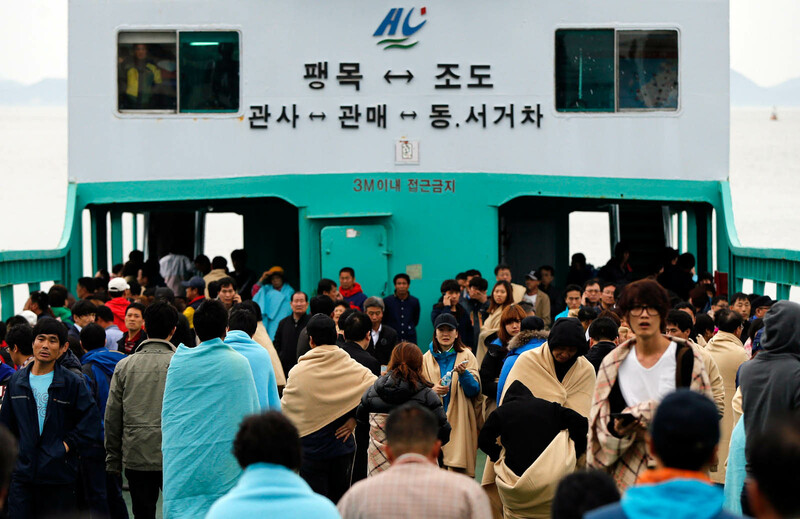 The warnings to not evacuate are repeated again and again as the ferry continues to descend into the sea off South Korea's south-west coast. 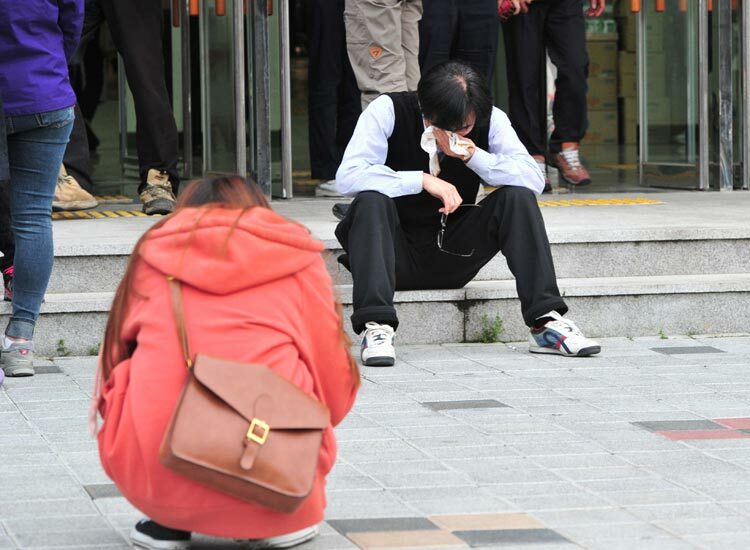 Presenting the video, Newstapa's broacaster Choi Seung Ho said: "This is by far the most heartbreaking scene I have seen in my 27-year broadcasting career." 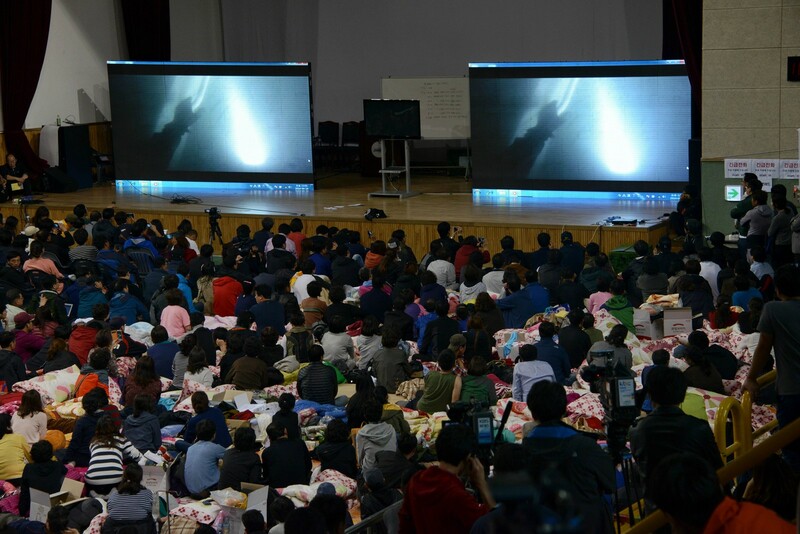 As one of the longer videos comes to an end, a student says, "I am scared." 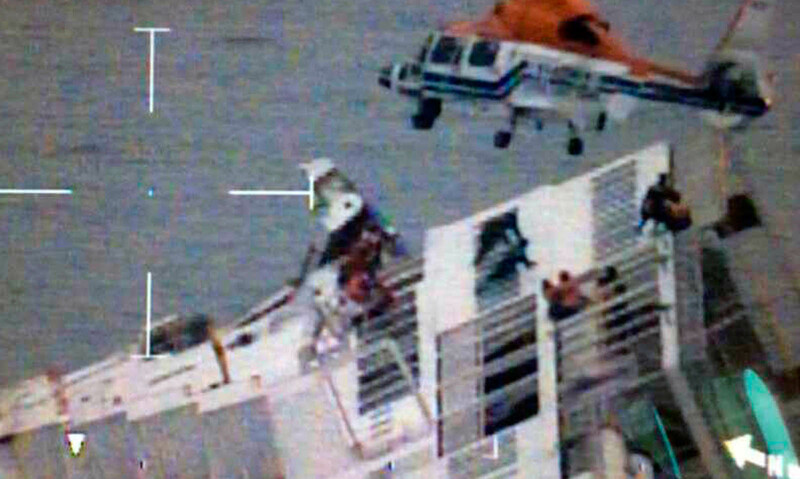 Other videos show students celebrating as helicopters approach the listing ship. 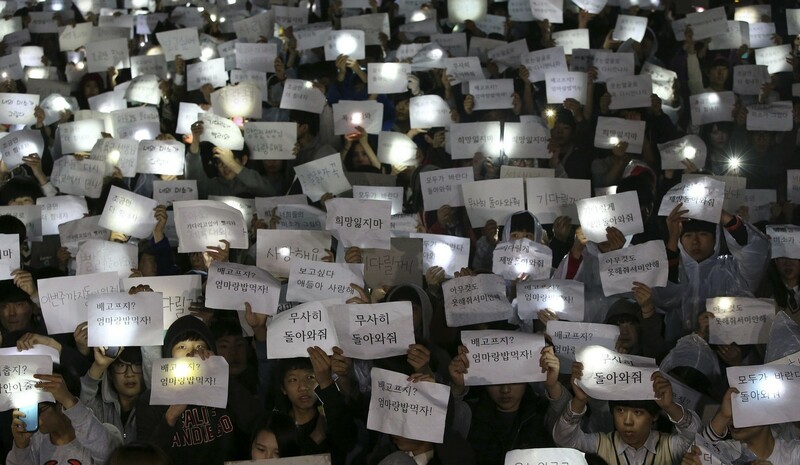 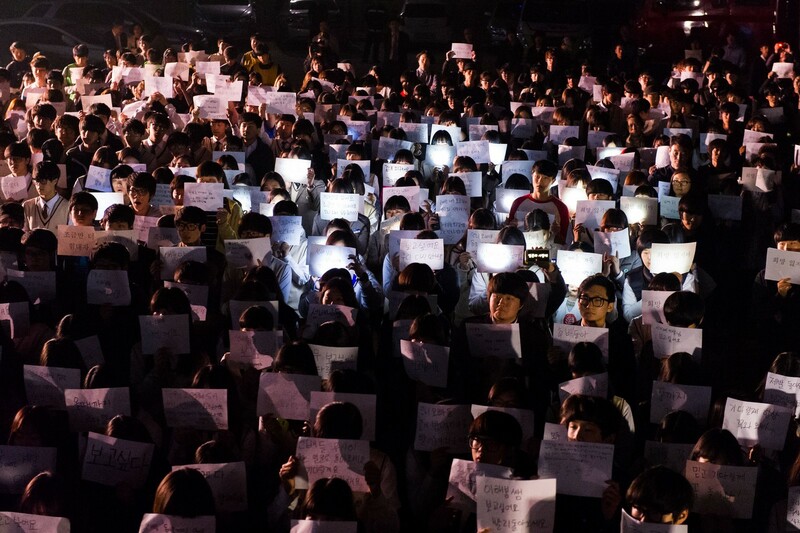 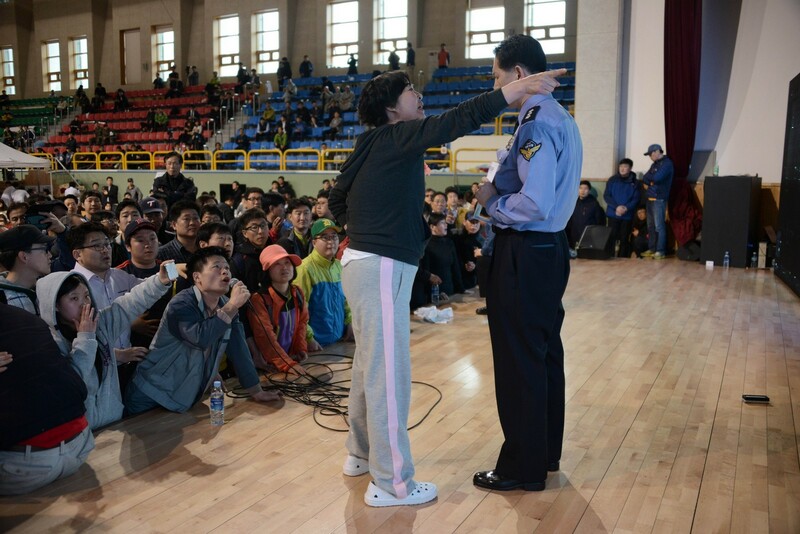 "This looks like the end," a boy shouts into a smartphone held by his classmate Park Su Hyeon. 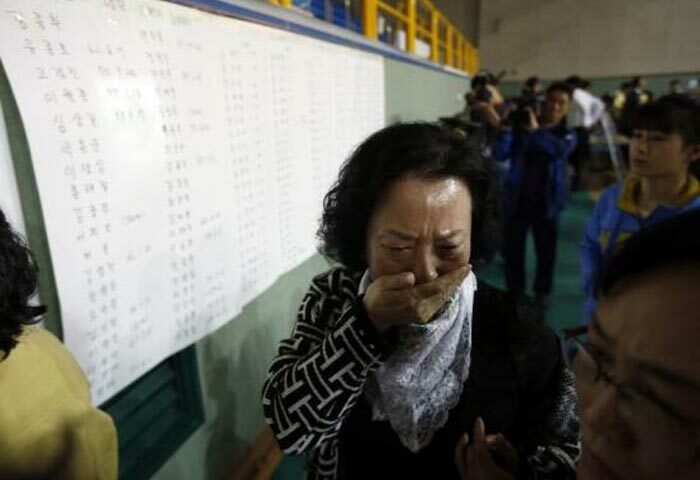 Another boy cuts in: "Mum, Dad, I love you." 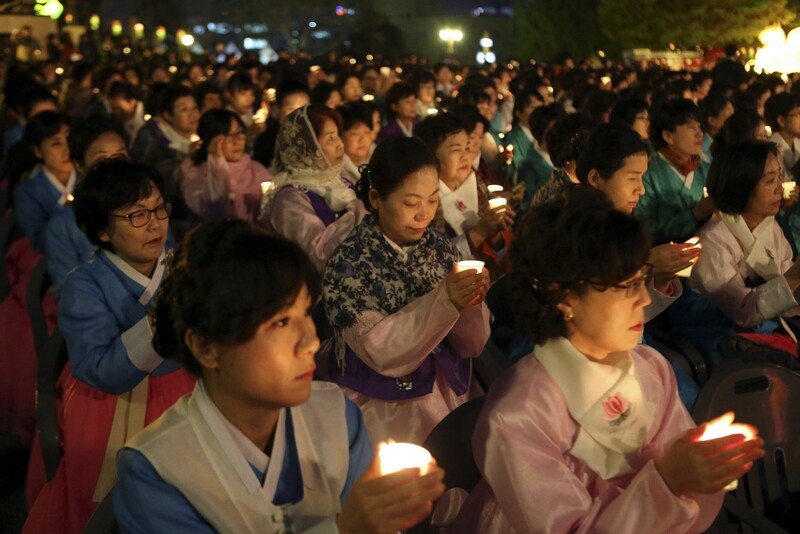 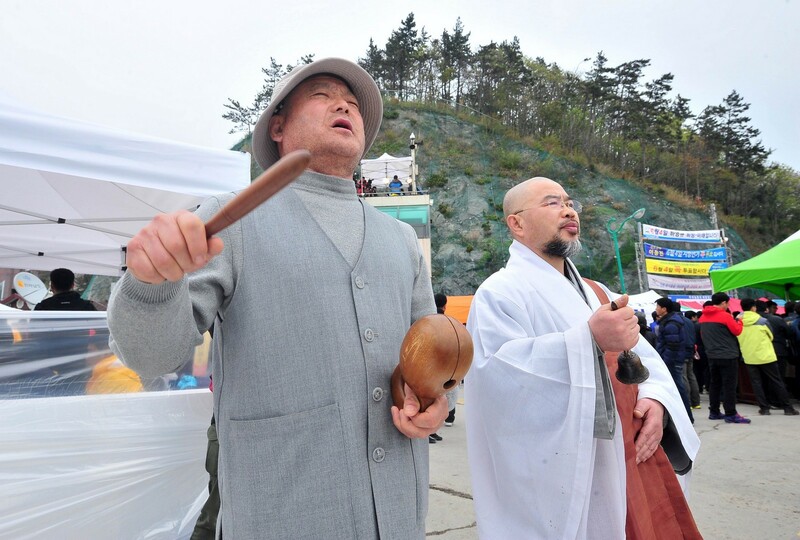 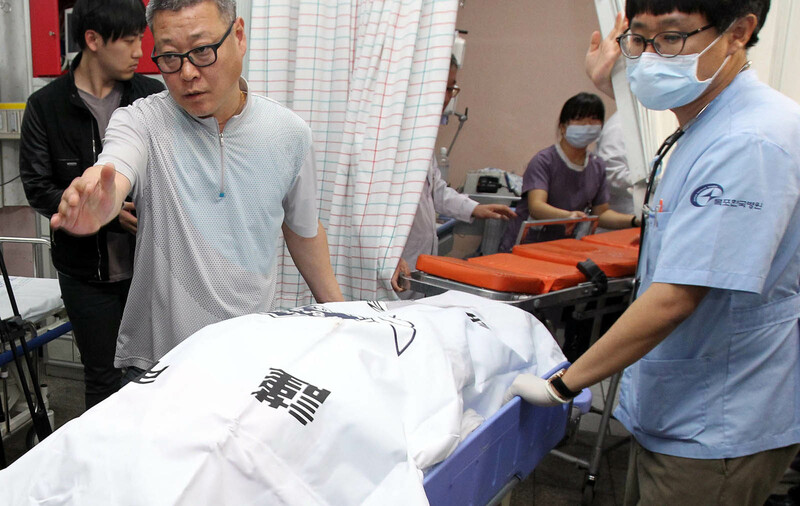 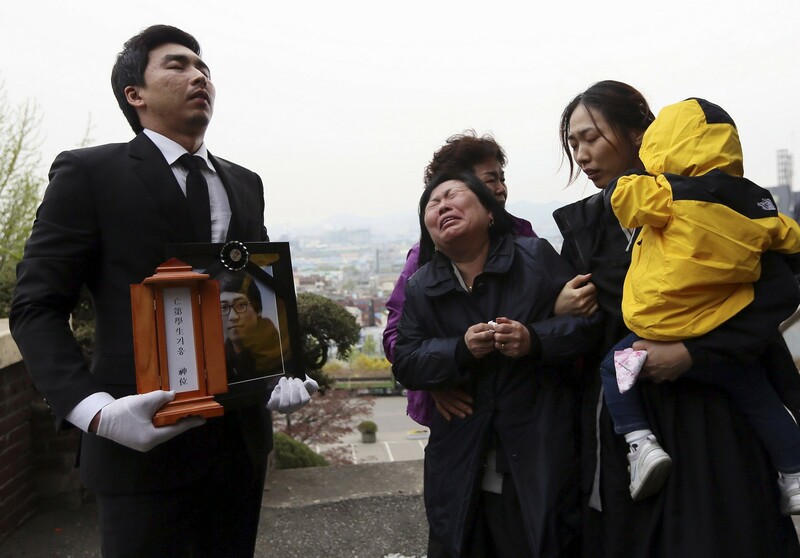 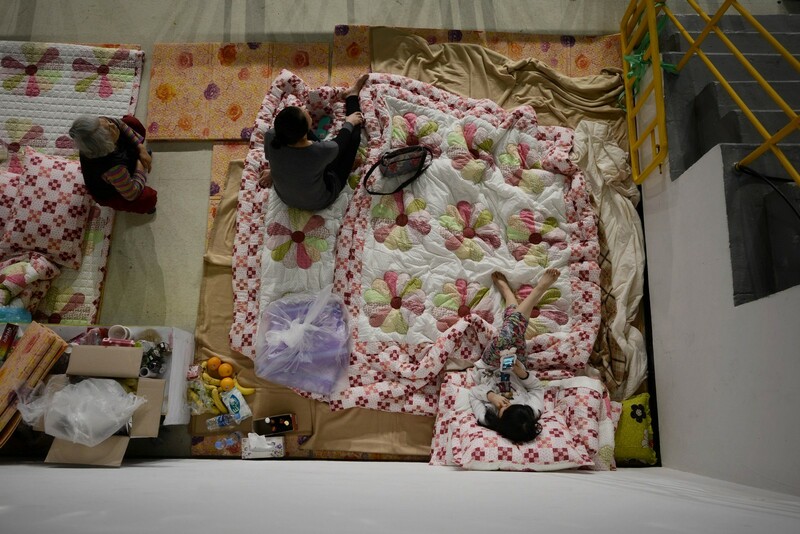 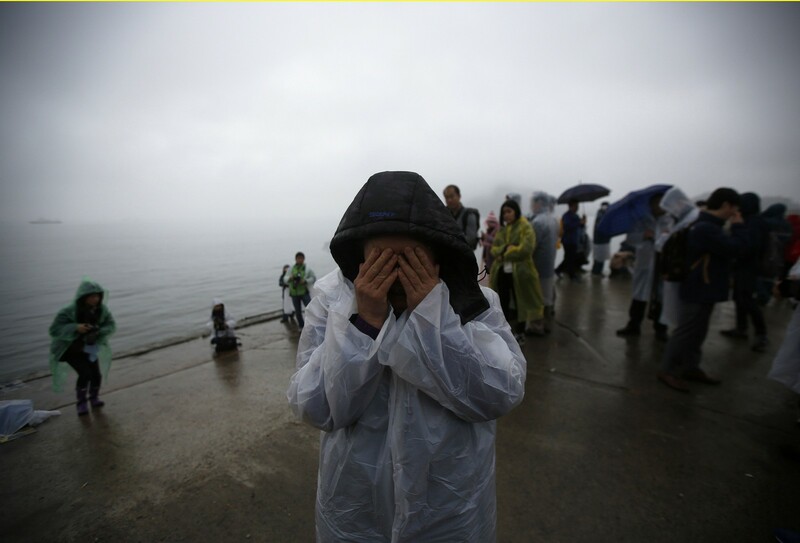 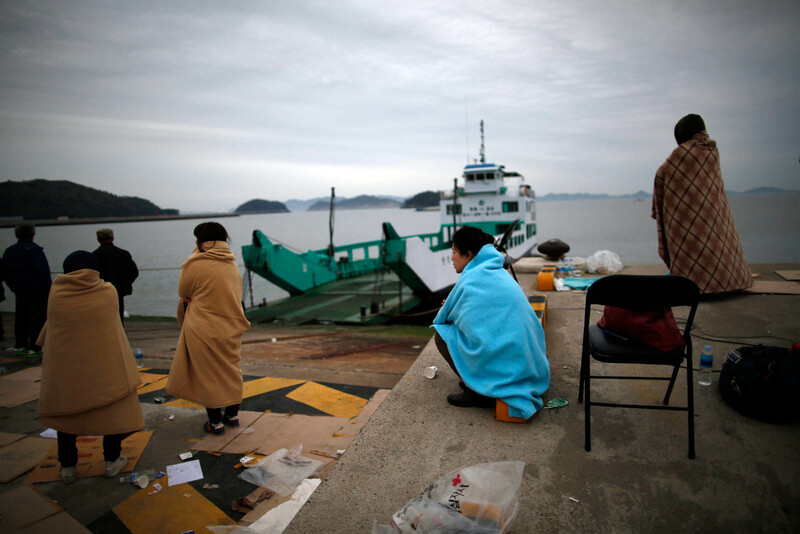 Family members of a passenger (L, in photograph) who died on South Korean ferry "Sewol" which sank off Jindo, cry during his funeral in Incheon April 19, 2014. 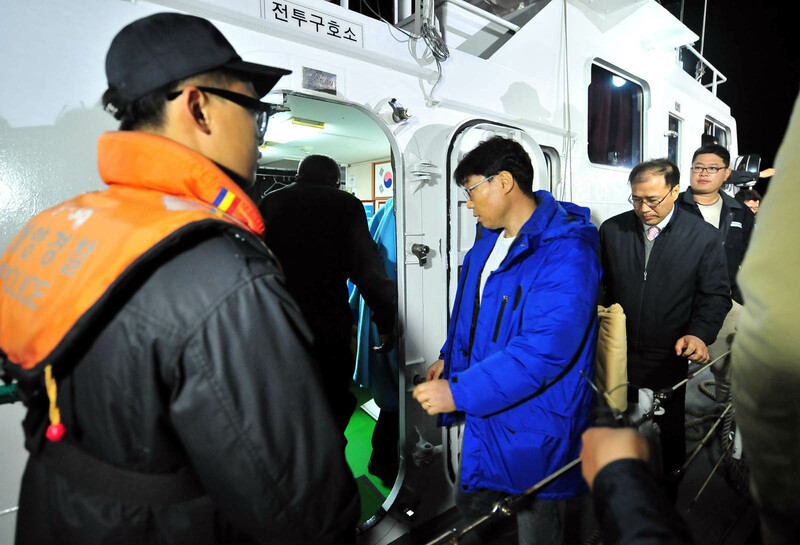 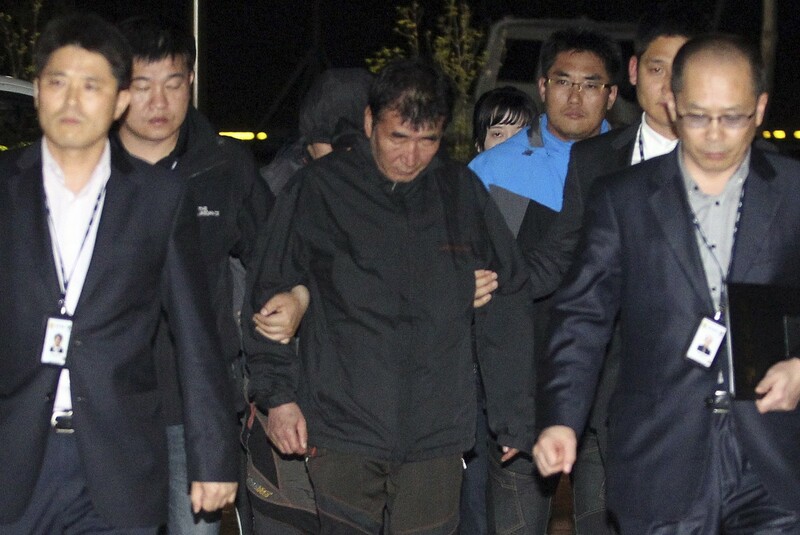 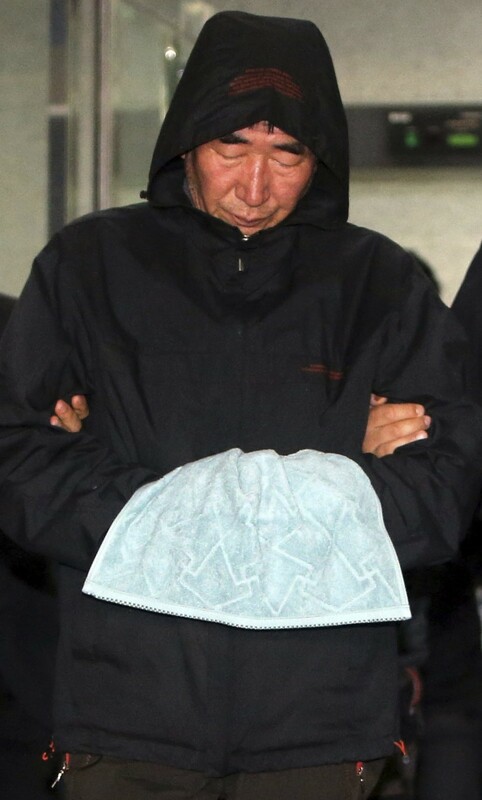 Lee Joon-Seok, captain of South Korean ferry "Sewol"
A family member of a missing passenger from South Korean ferry "Sewol"
Lee Joon-Seok (C), captain of the South Korean ferry Sewol which capsized on Wednesday, arrives at a court in Mokpo April 18, 2014. 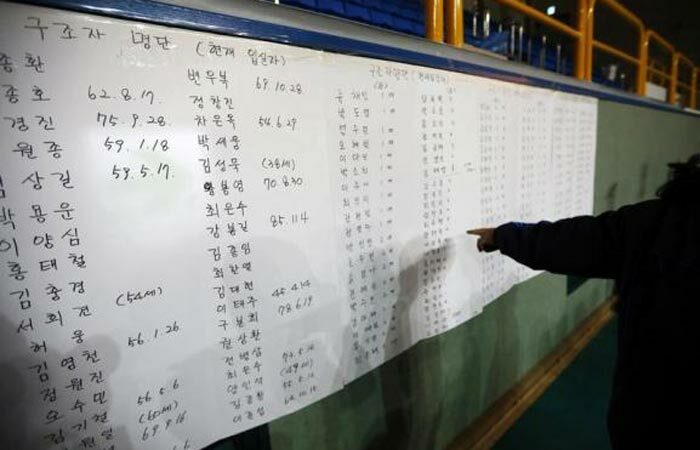 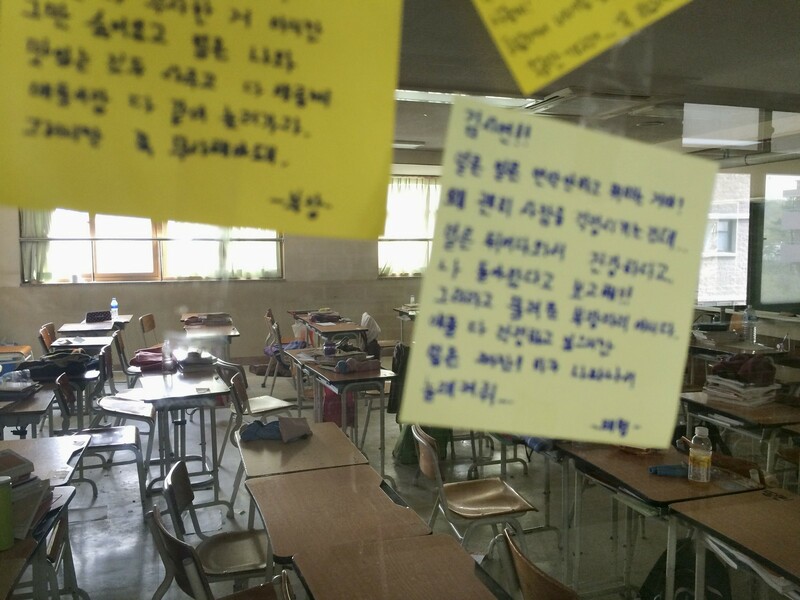 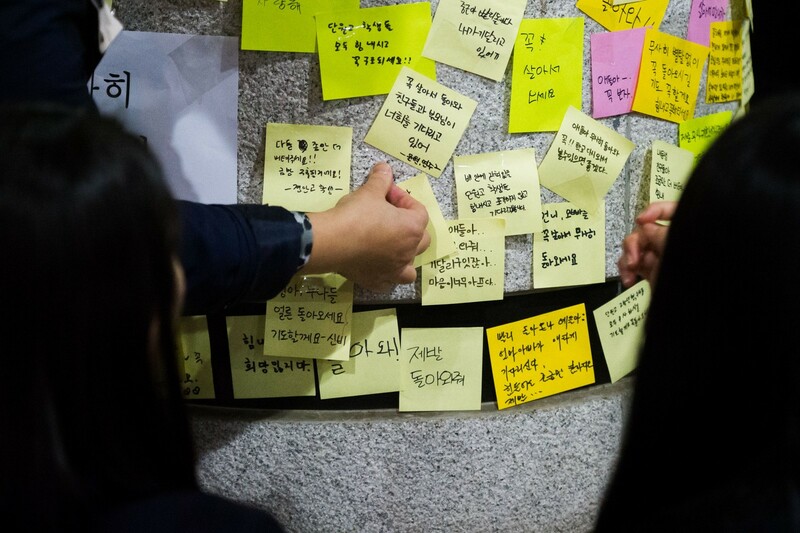 Messages left by fellow students are stuck to the classroom windows of students missing in the South Korean ferry disaster at Danwon High School in Ansan April 18, 2014. 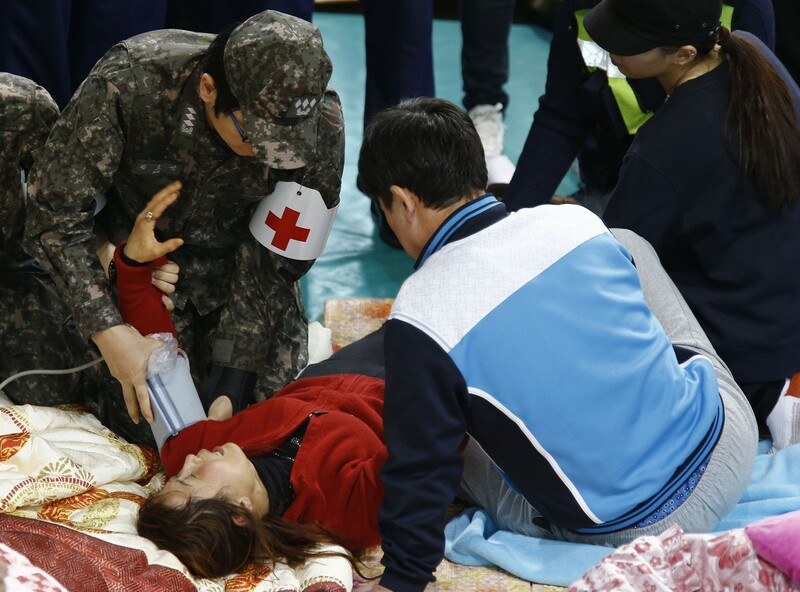 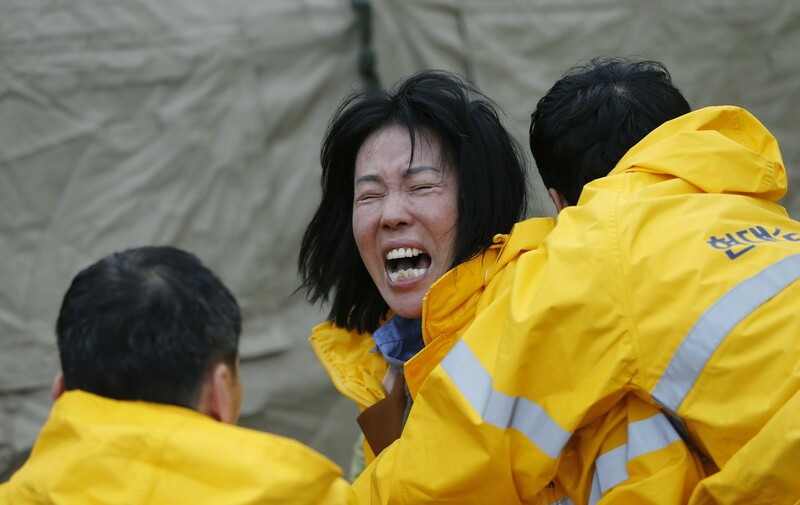 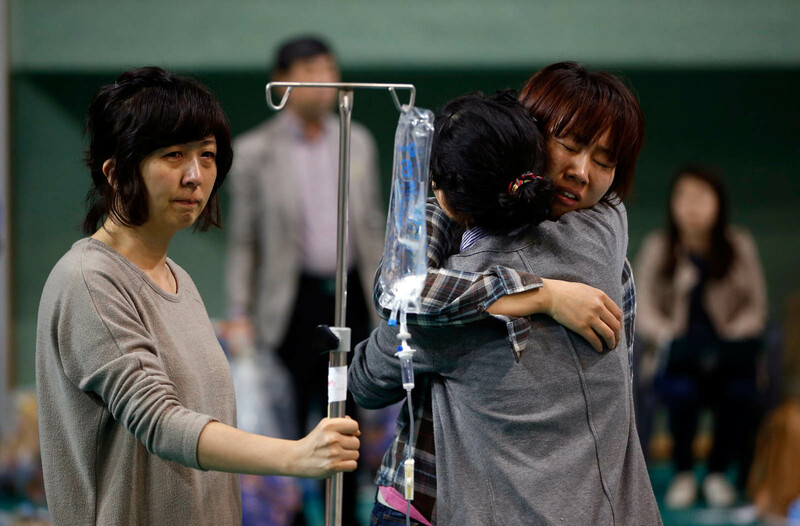 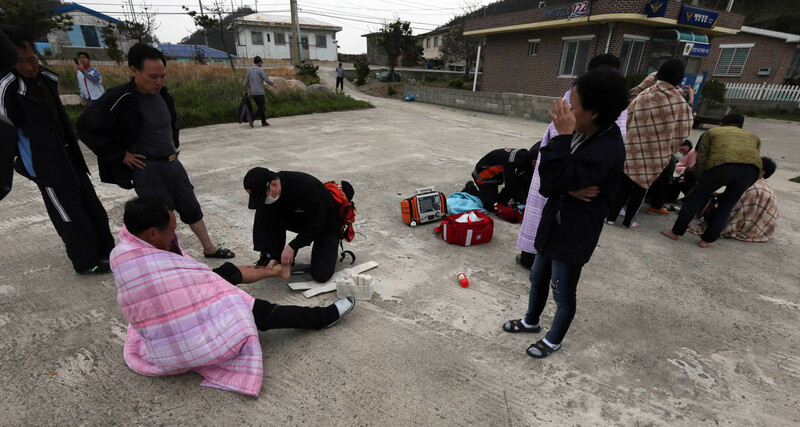 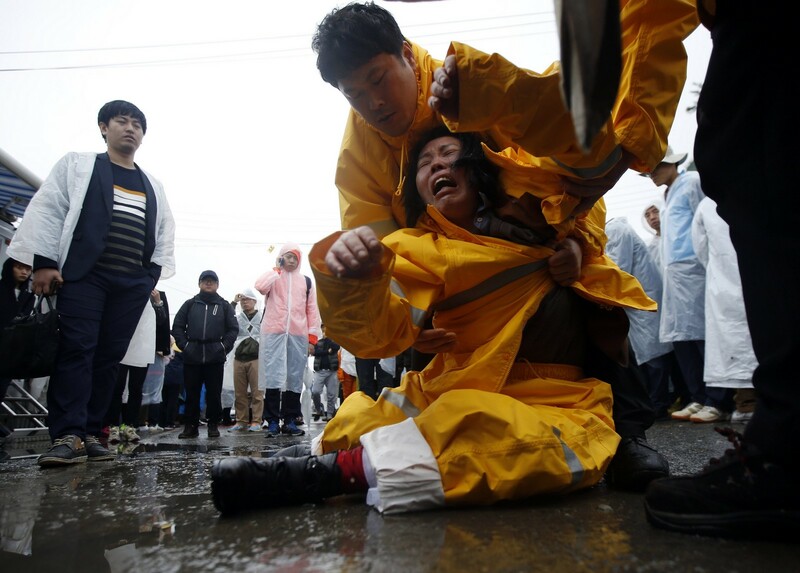 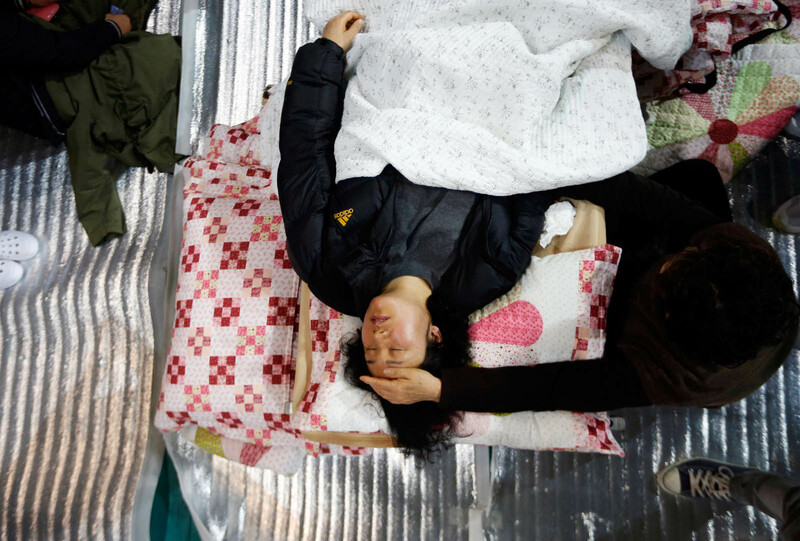 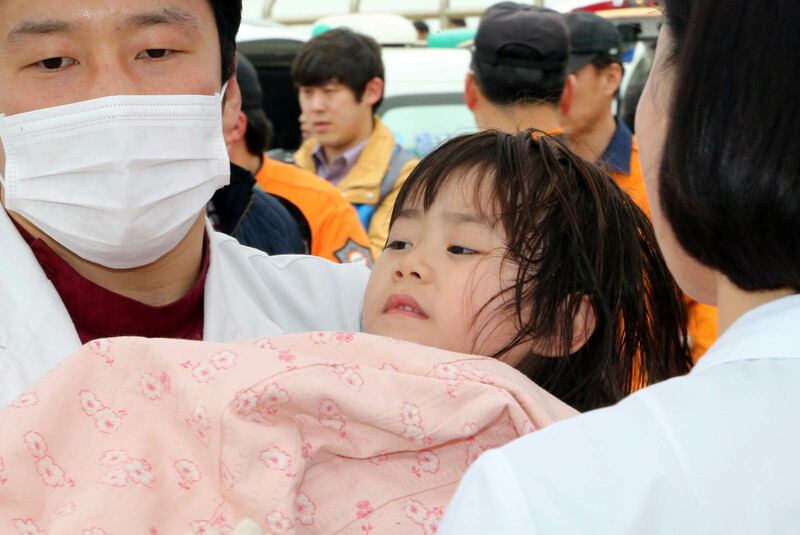 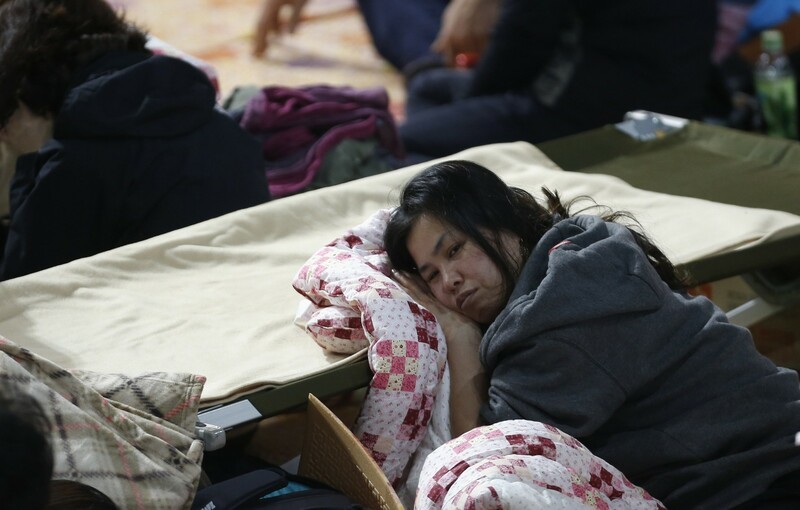 A medic helps the collapsed family member of a missing passenger from South Korean ferry "Sewol", which sank in the sea off Jindo, as she cries while waiting for news from the rescue team, at a gym in Jindo April 18, 2014. 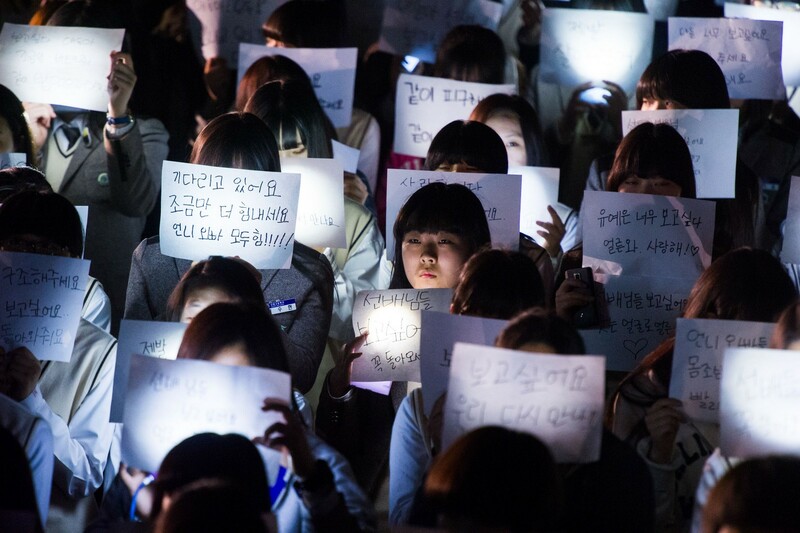 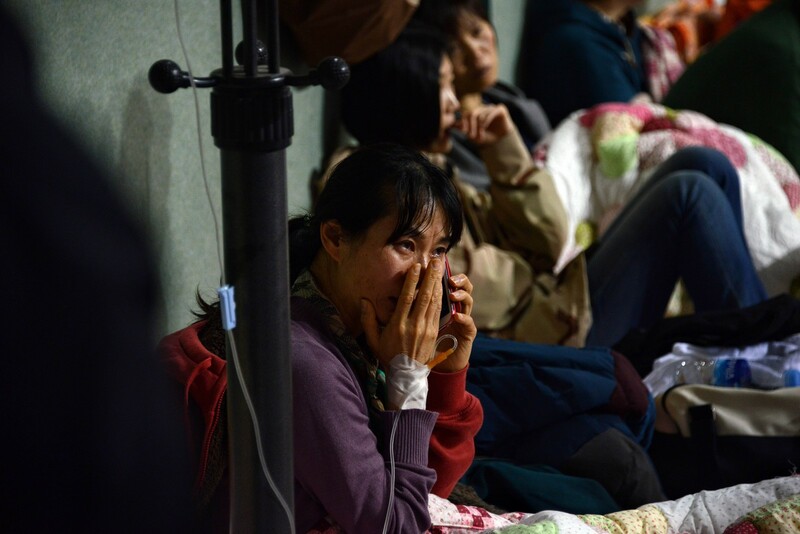 Family members of missing passengers who were on South Korean ferry "Sewol", which sank in the sea off Jindo, cry as they wait for news from the rescue team, at a gym in Jindo April 18, 2014. 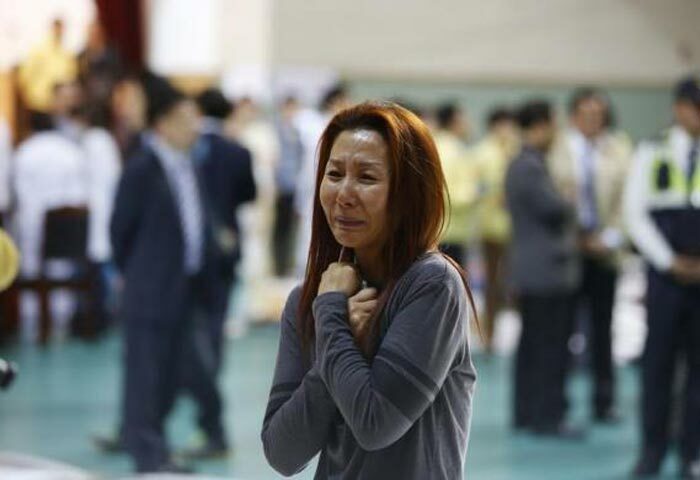 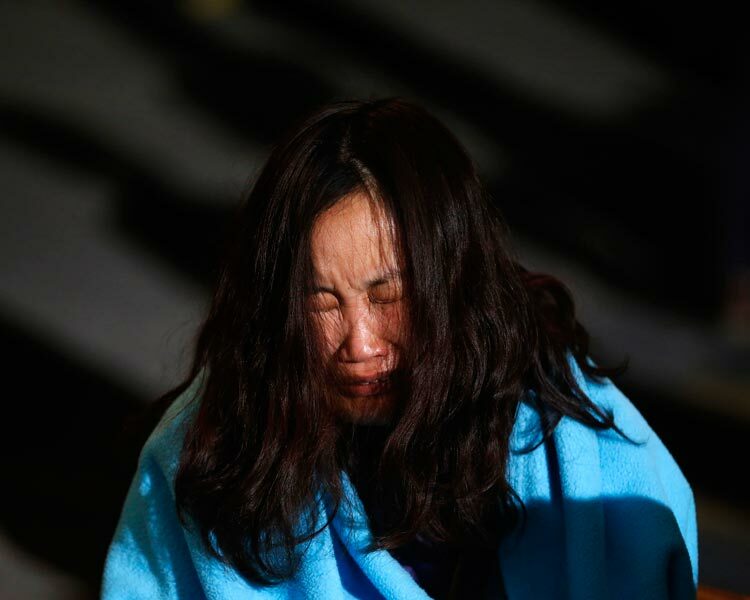 The family member of a missing passenger who was on South Korean ferry "Sewol", which sank in the sea off Jindo, is helped as she cries while waiting for news from the rescue team, at a gym in Jindo April 18, 2014. 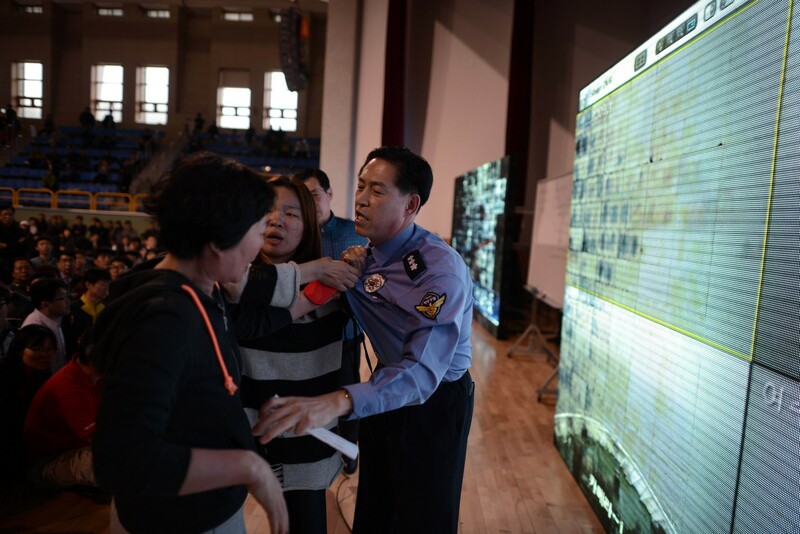 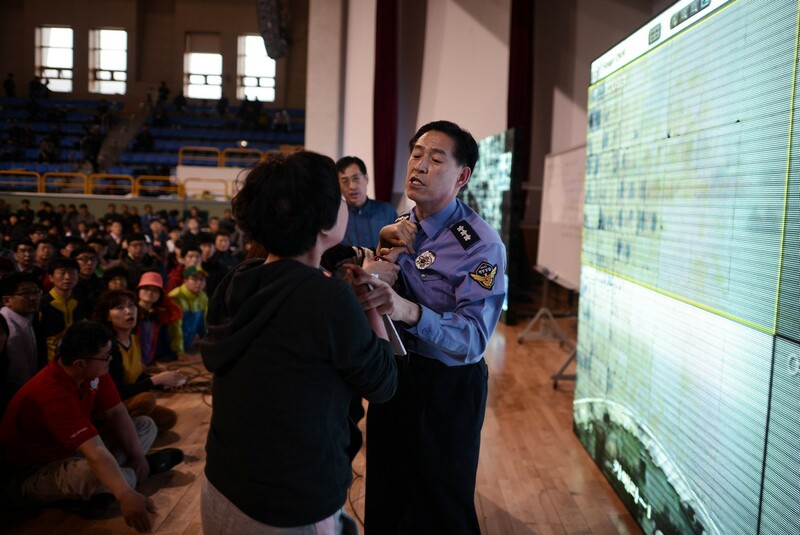 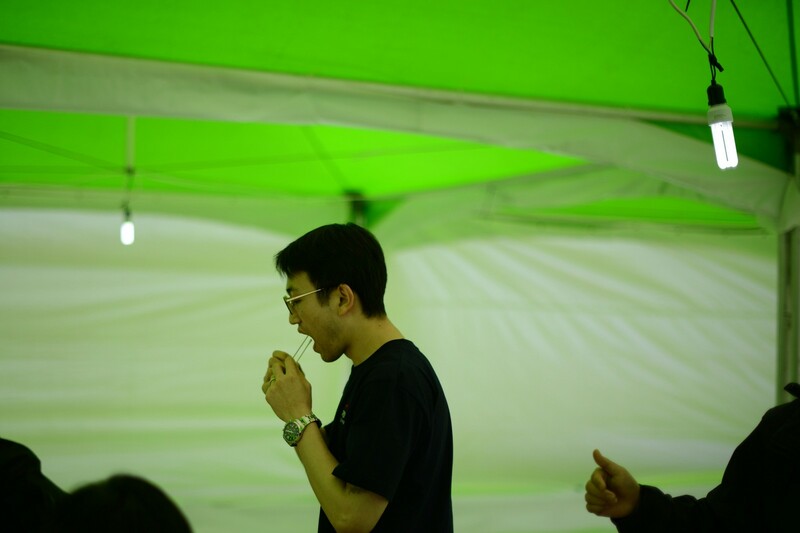 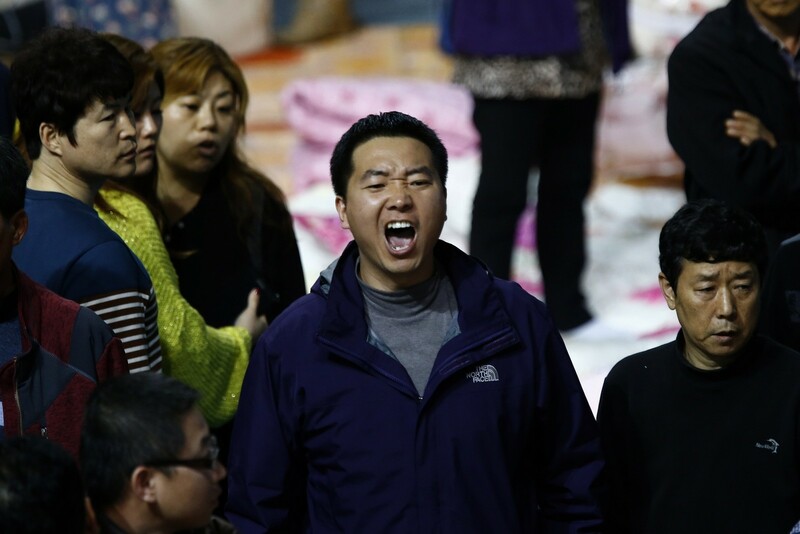 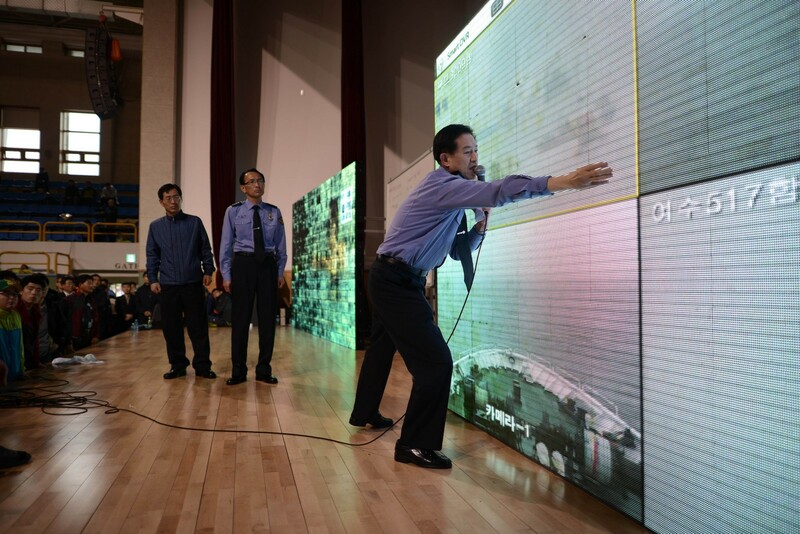 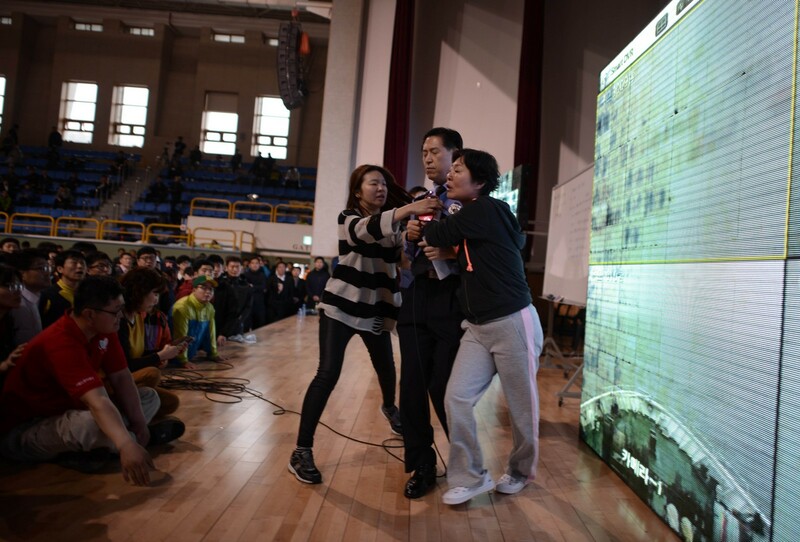 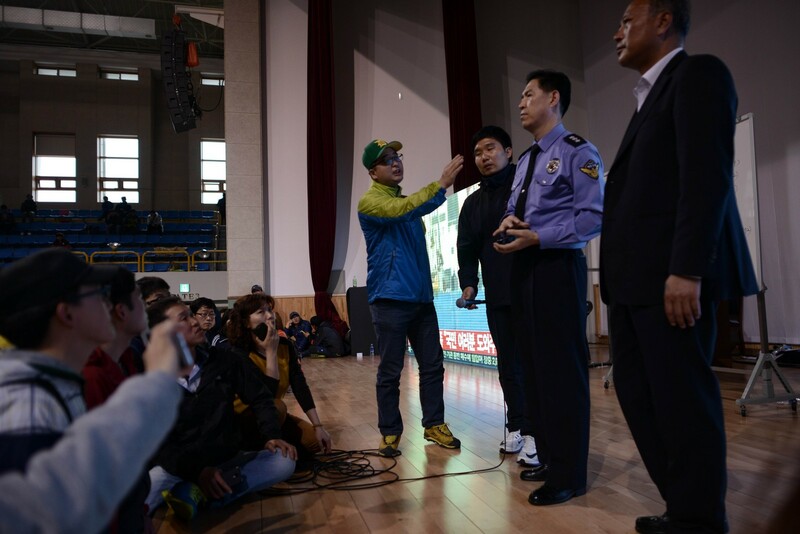 The family member of a missing passenger from South Korean ferry "Sewol", which sank in the sea off Jindo, shouts as he complains to officials from the South Korean Coast Guard, as family members listen to a briefing about the rescue operation, at a gym in Jindo April 18, 2014. 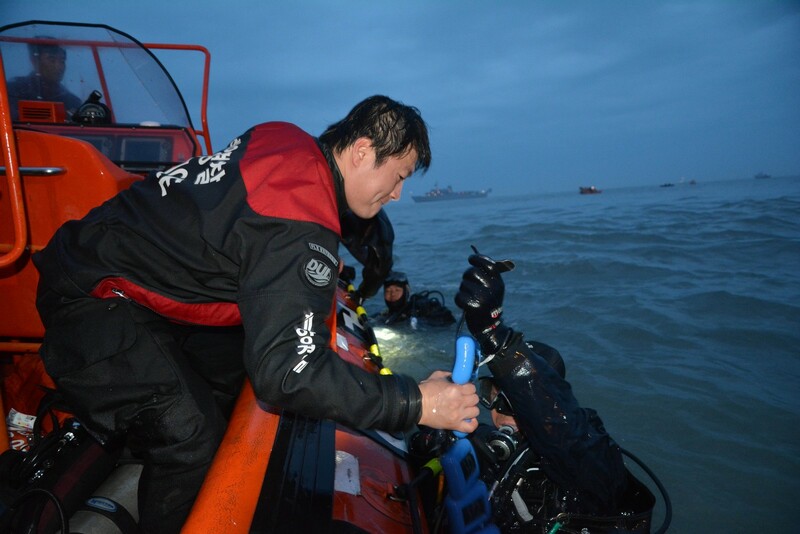 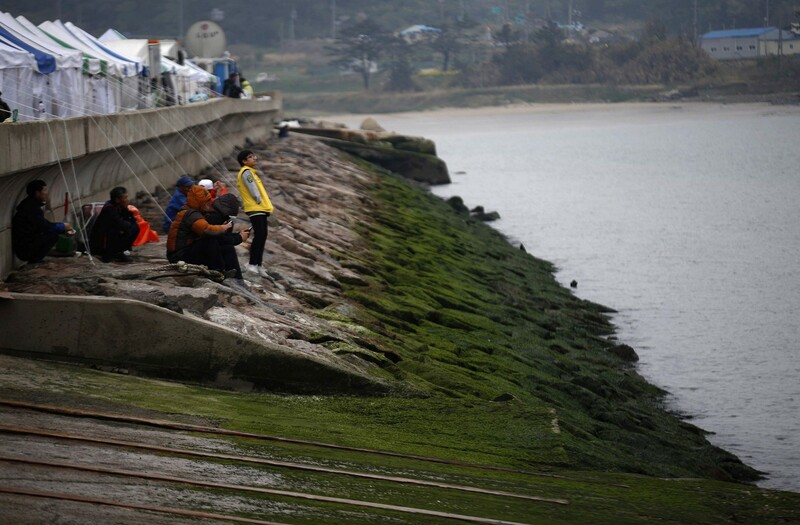 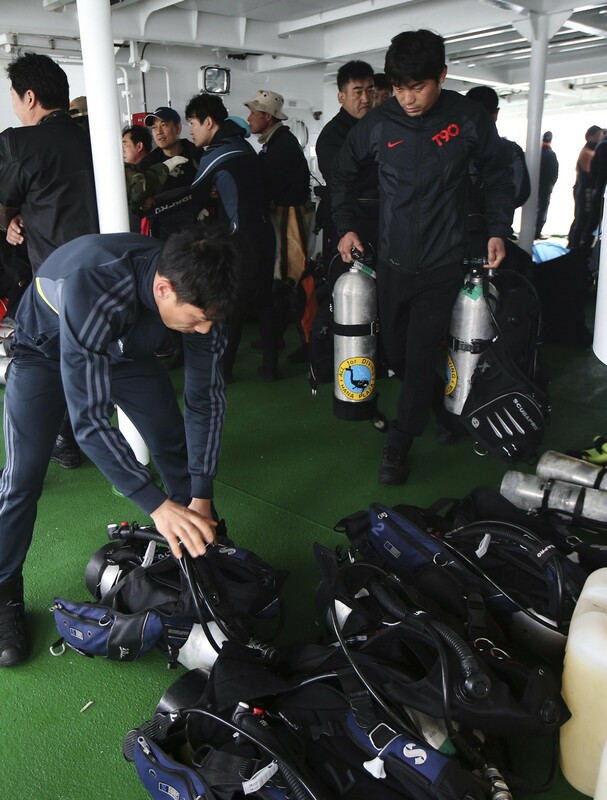 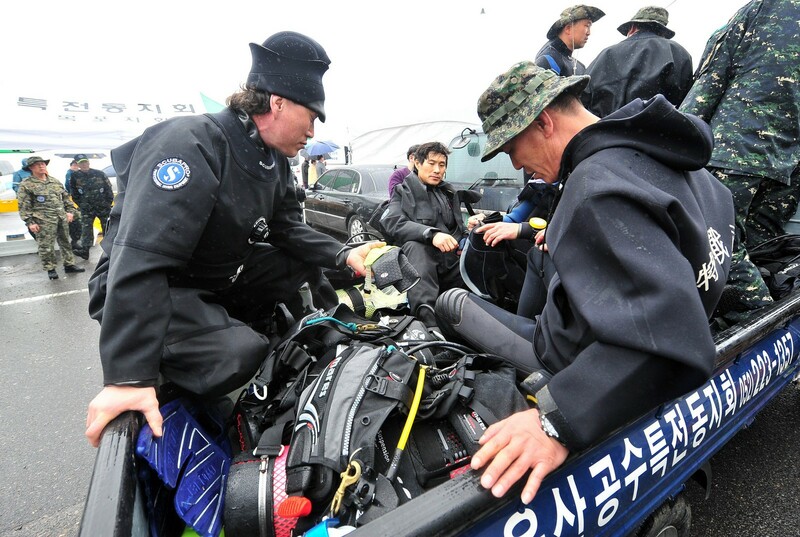 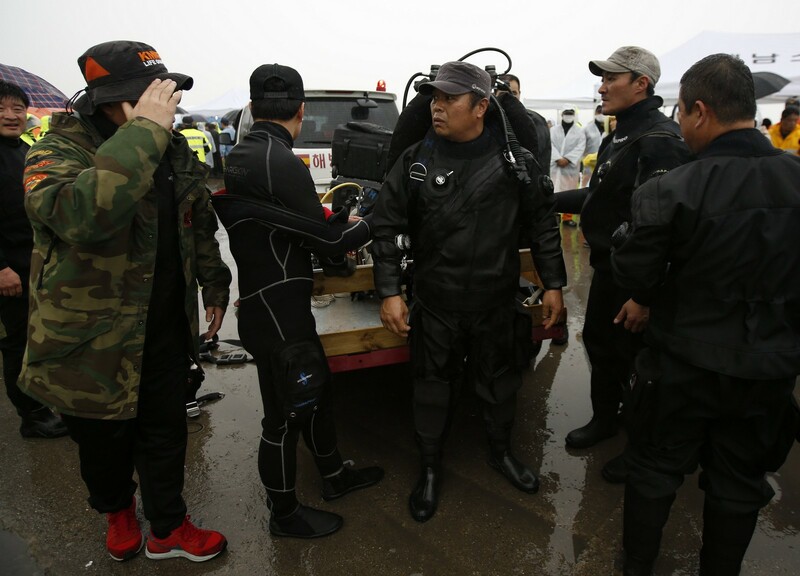 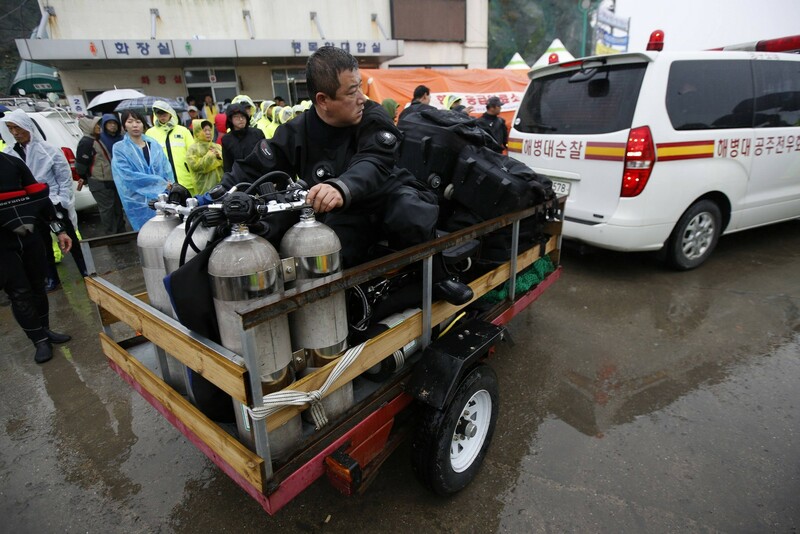 South Korean divers prepare to go the location where a ferry capsized two days ago, at a harbor in Jindo on April 18, 2014. 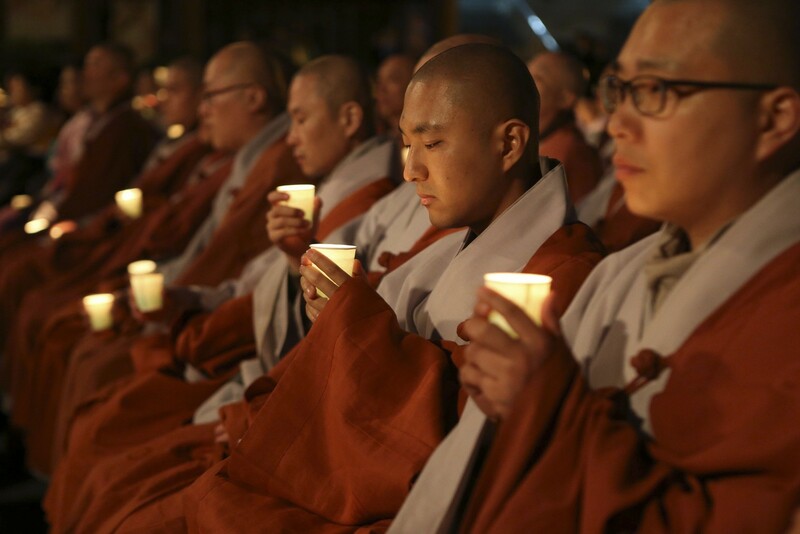 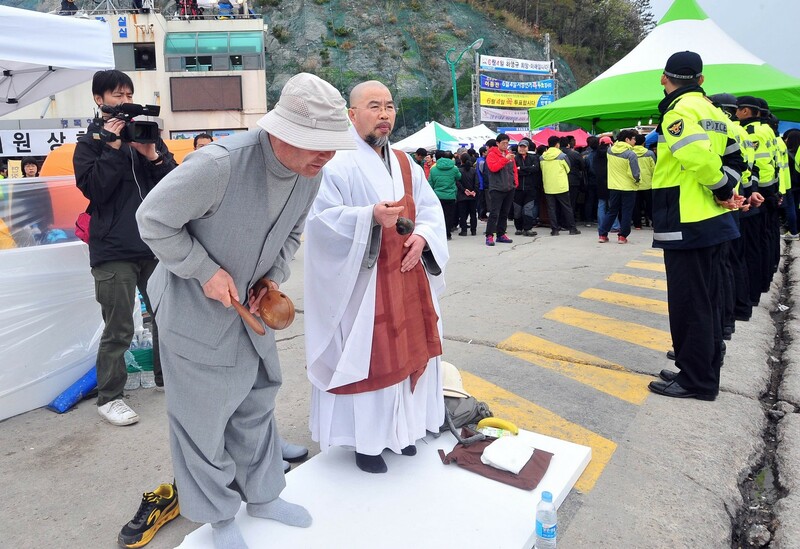 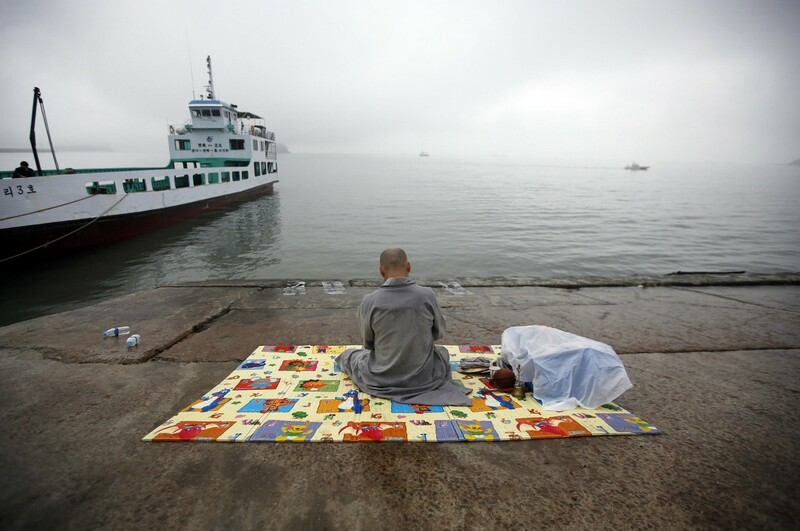 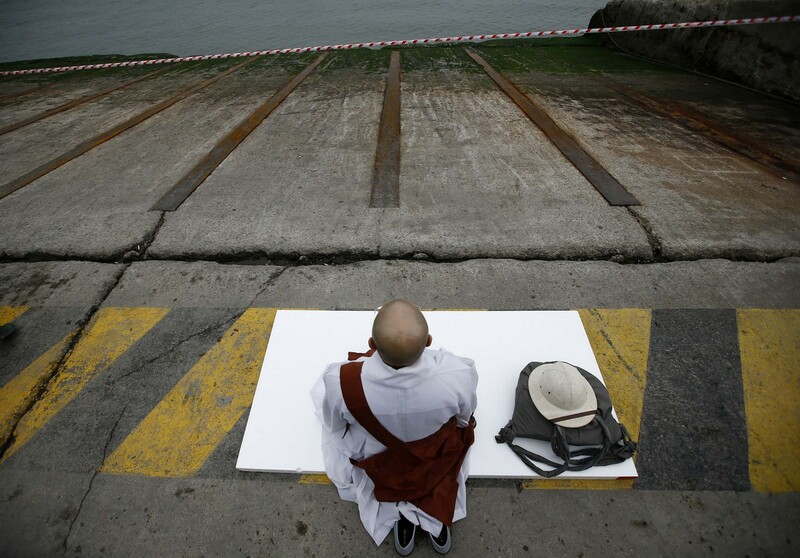 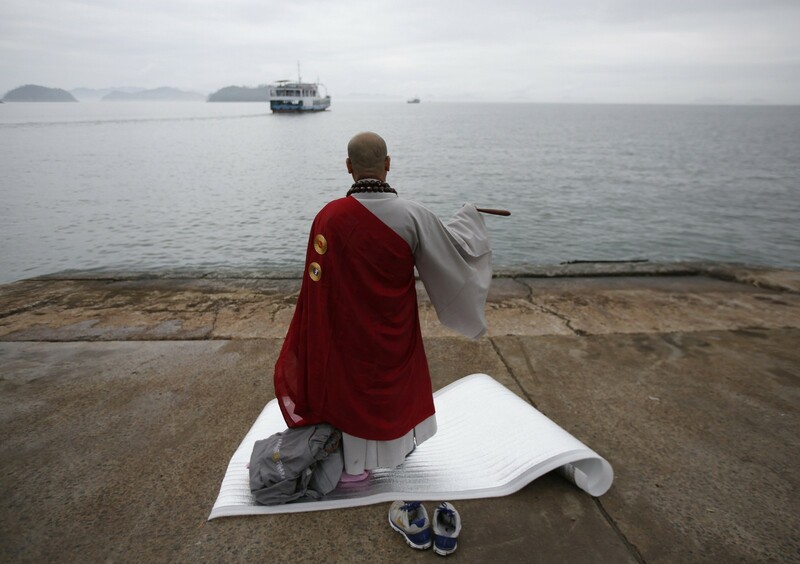 A Buddhist monk prays for missing passengers who were on the South Korean ferry "Sewol"
South Korean coastguard and navy divers resumed searching on Thursday for about 290 people still missing, many of them students from the same high school, after a ferry capsized in sight of land. 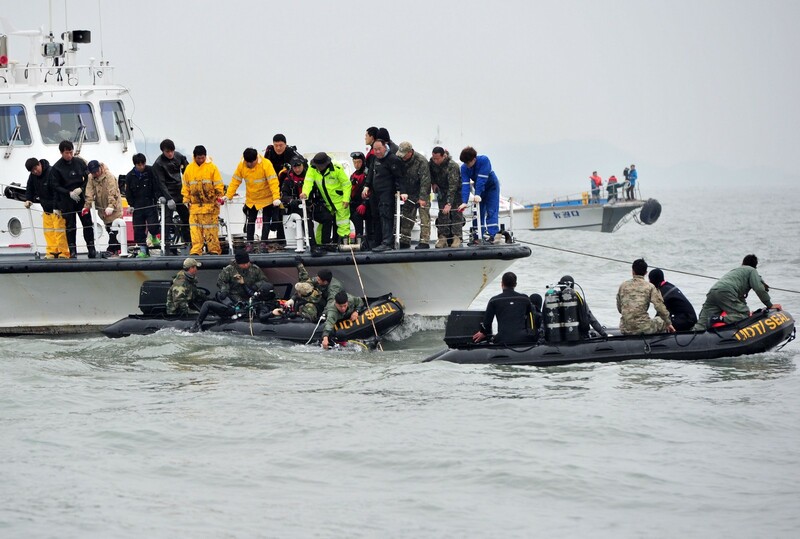 South Korean rescue teams, including elite navy SEAL divers, raced to find up to 293 people missing from a capsized ferry carrying 459 passengers and crew -- mostly high school students bound for a holiday island. More than 100 people remained missing on Wednesday after a South Korean ferry with 477 people aboard capsized off the country's southwest coast, Yonhap news agency said. 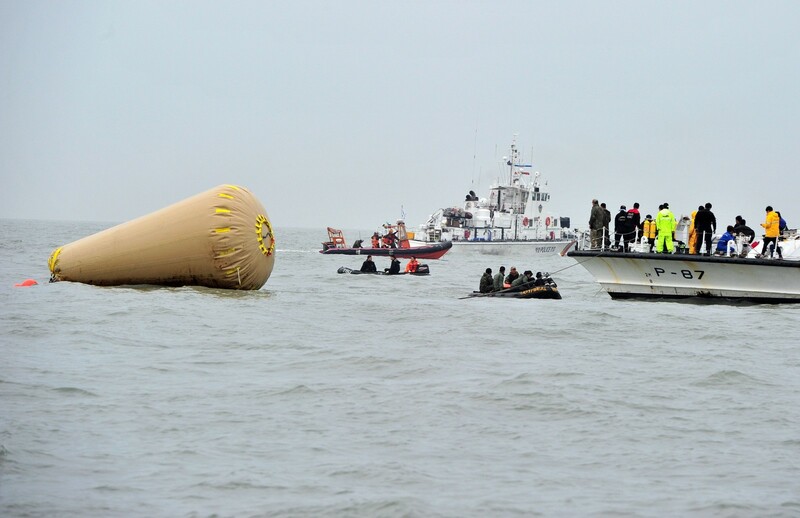 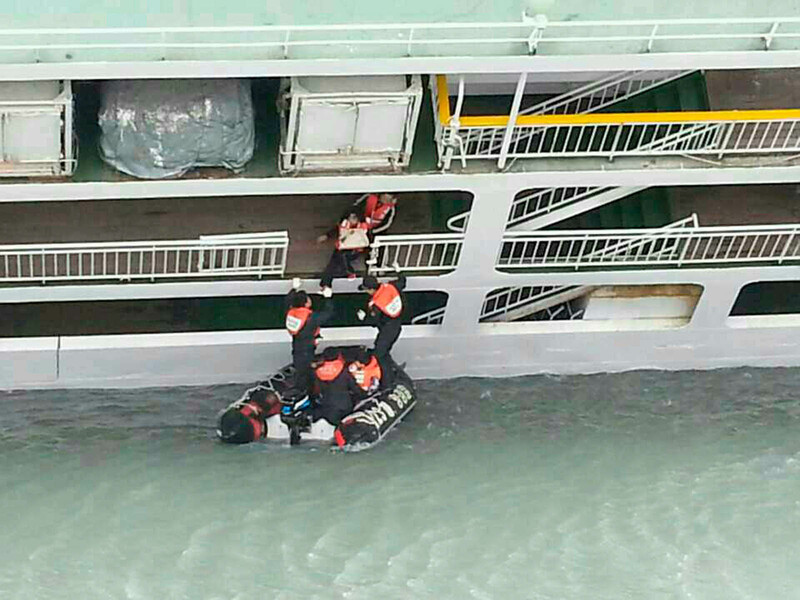 About 160 passengers, including high school students, were plucked to safety on Wednesday in a dramatic rescue from a South Korean passenger ferry "Sewol" sinking with 475 on board, officials said, although at least two people had died. 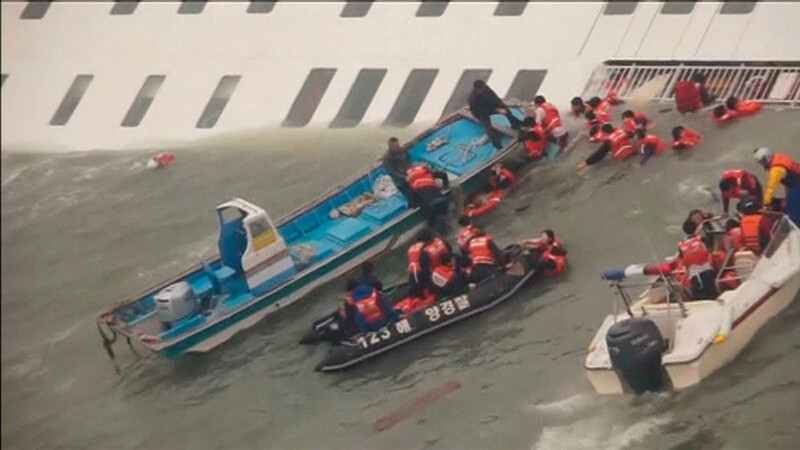 All 338 high school students and teachers on board a South Korean passenger ferry that was reported to be sinking on Wednesday have been rescued, a school official told Reuters. 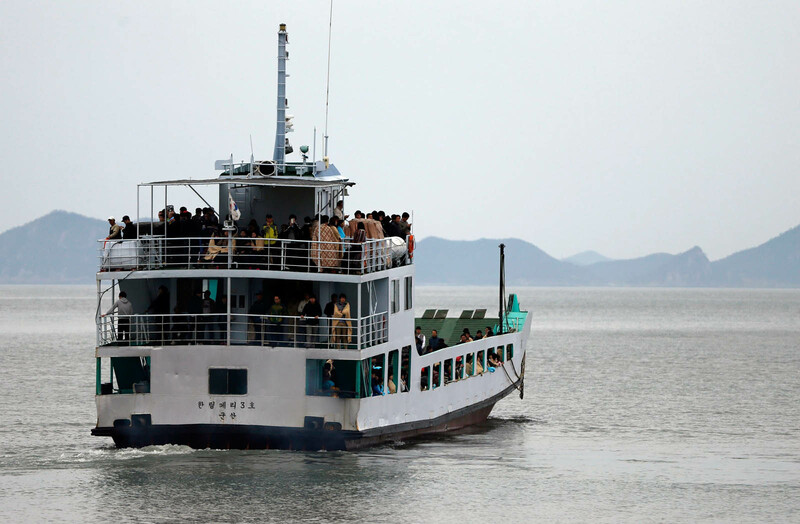 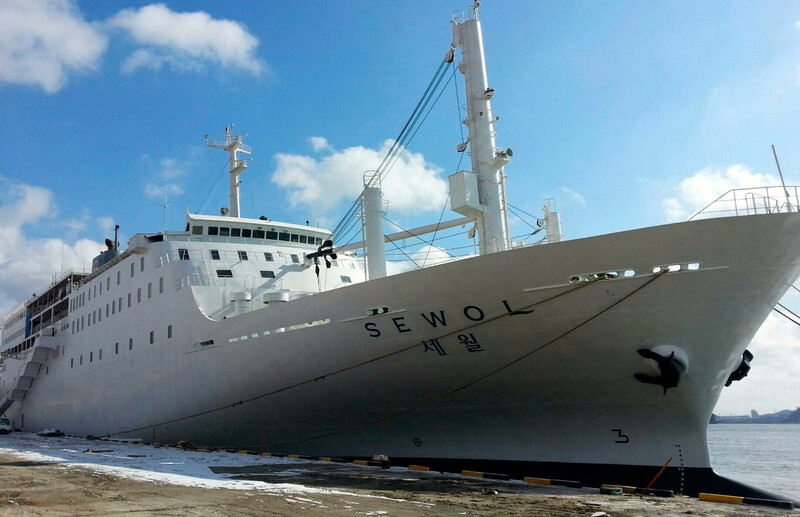 The ferry, identified as the Sewol, was carrying about 470 passengers, including the students and teachers, en route to Jeju island, about 100 km (60 miles) south of the Korean peninsula. 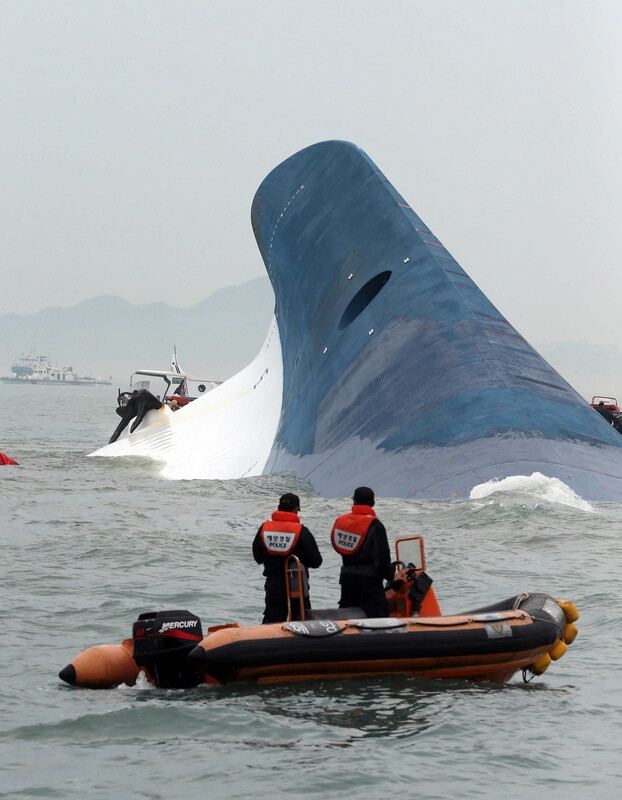 It sent a distress signal after it began to list badly. 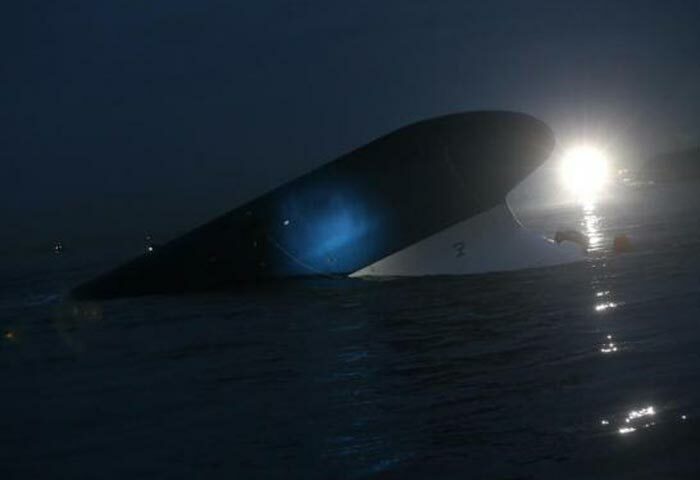 "The ship is taking in water and sinking," a coastguard spokesman told AFP by phone. 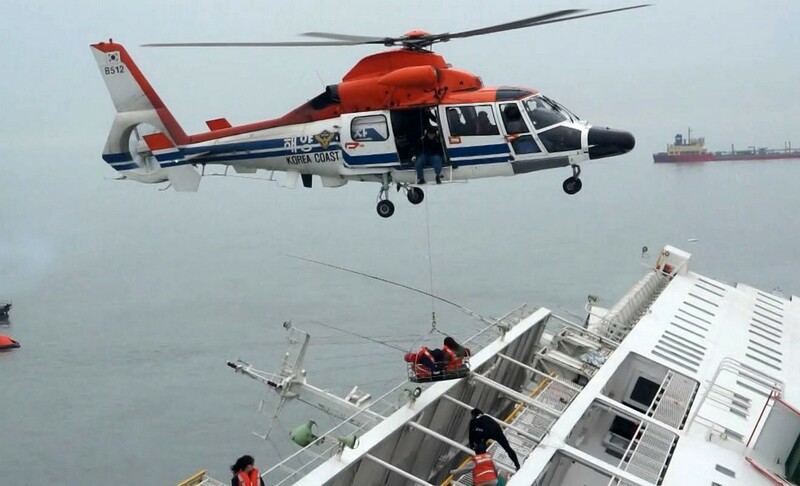 "There are around 450 people on board and we have coastguard vessels, commercial ships in the area, as well as helicopters all engaged in the rescue operation," the spokesman said. 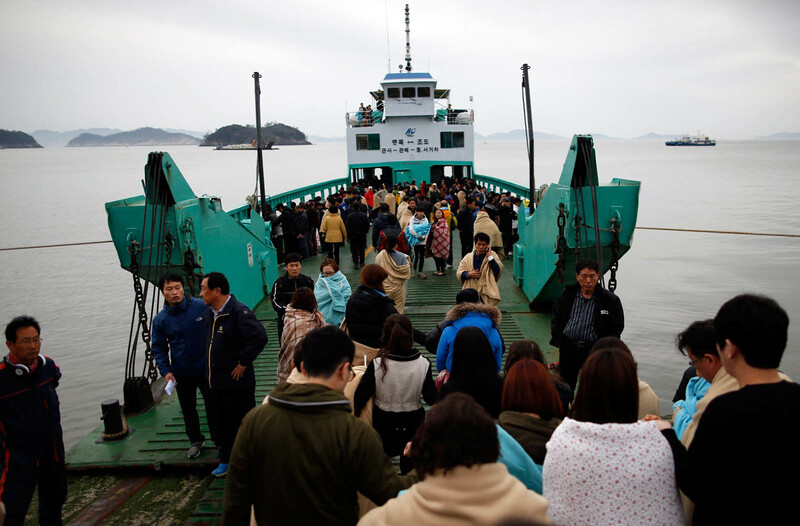 Earlier reports had put the number of people on board at 350. 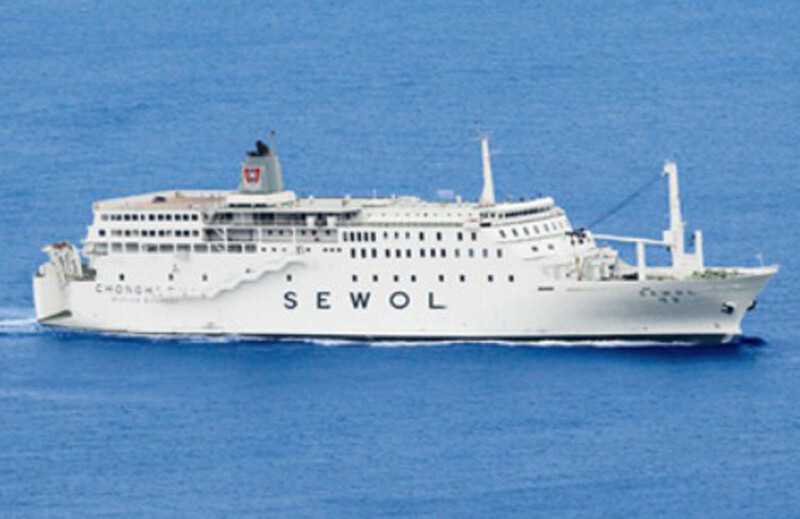 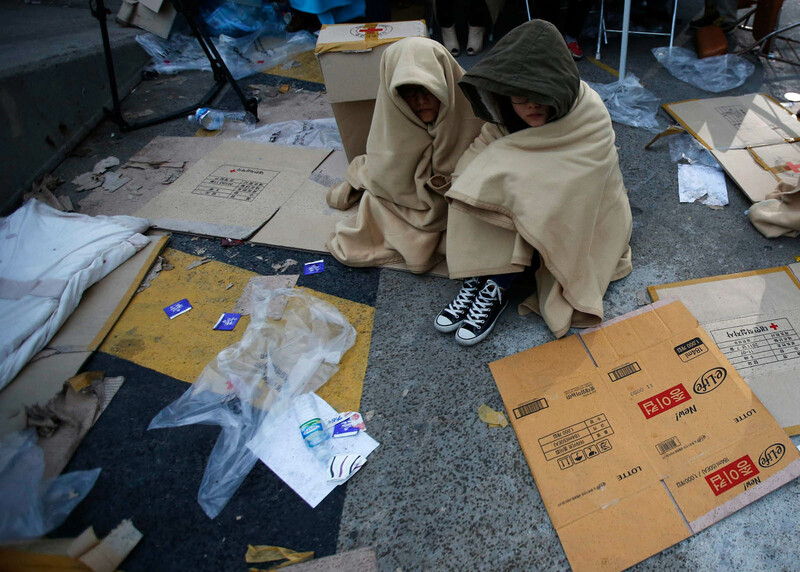 Most of the passengers were believed to be high school students on a trip to the southern resort island of Jeju. 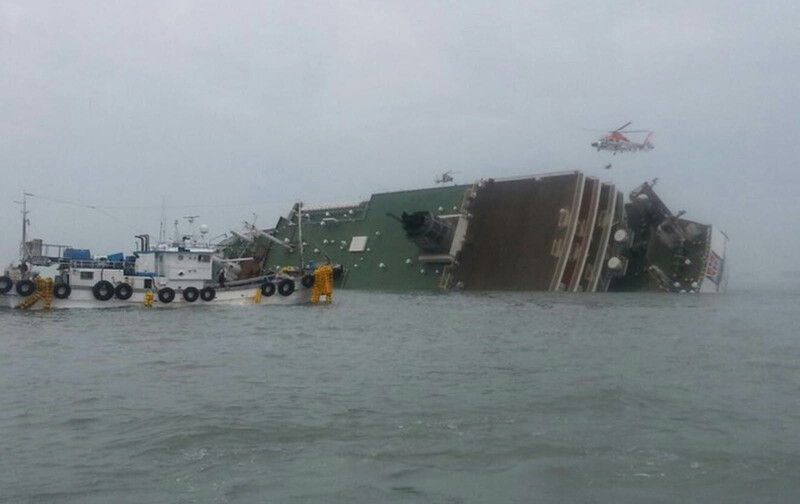 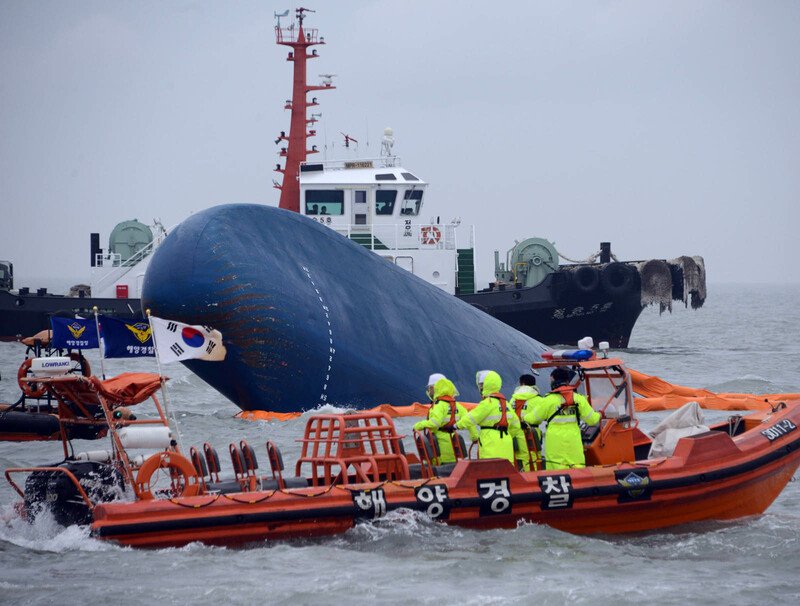 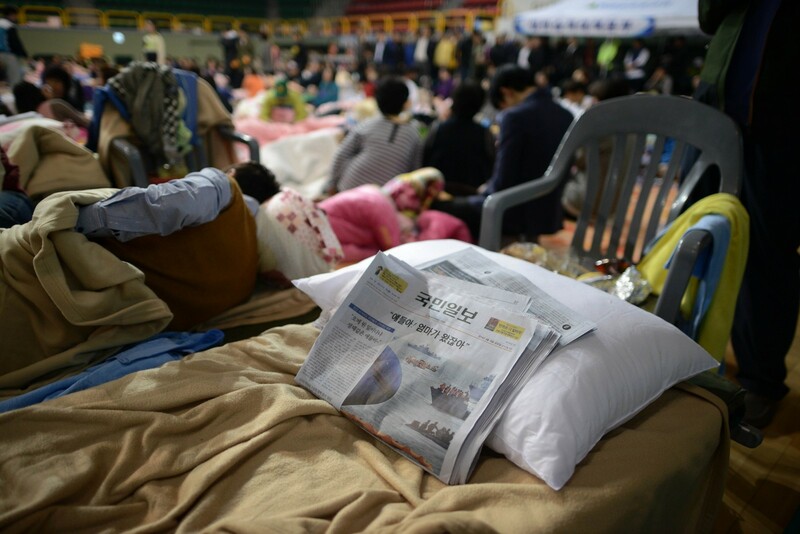 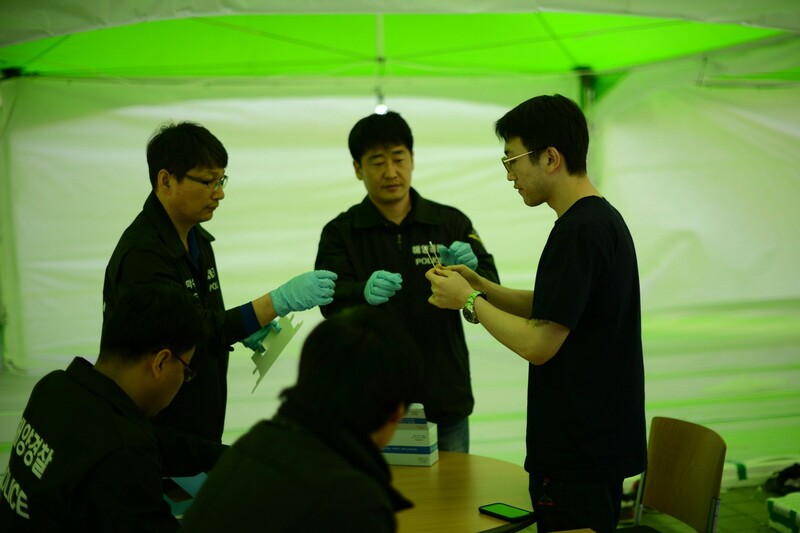 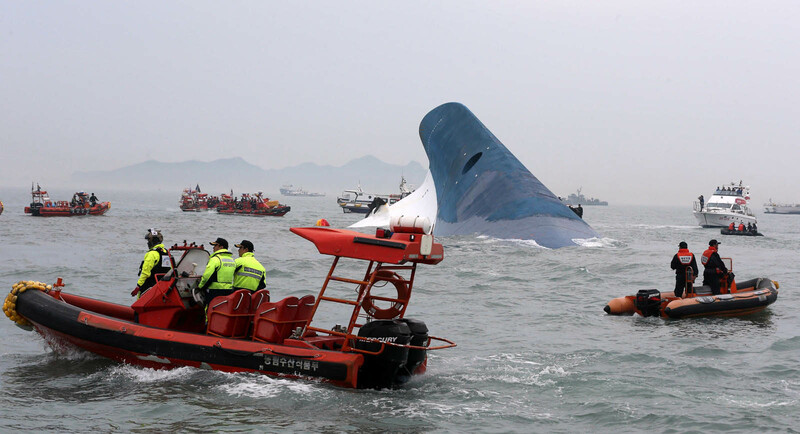 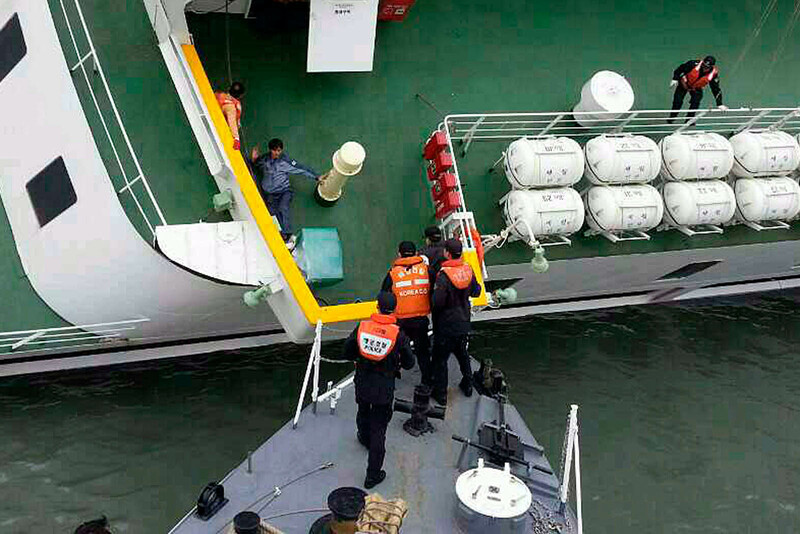 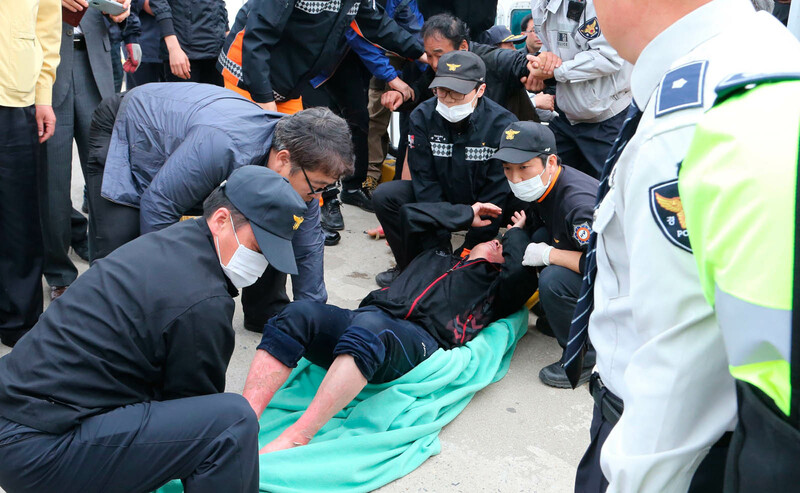 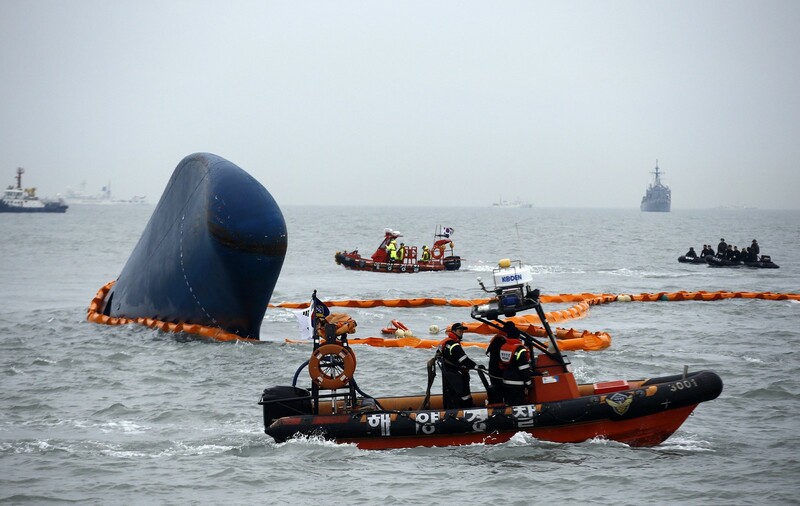 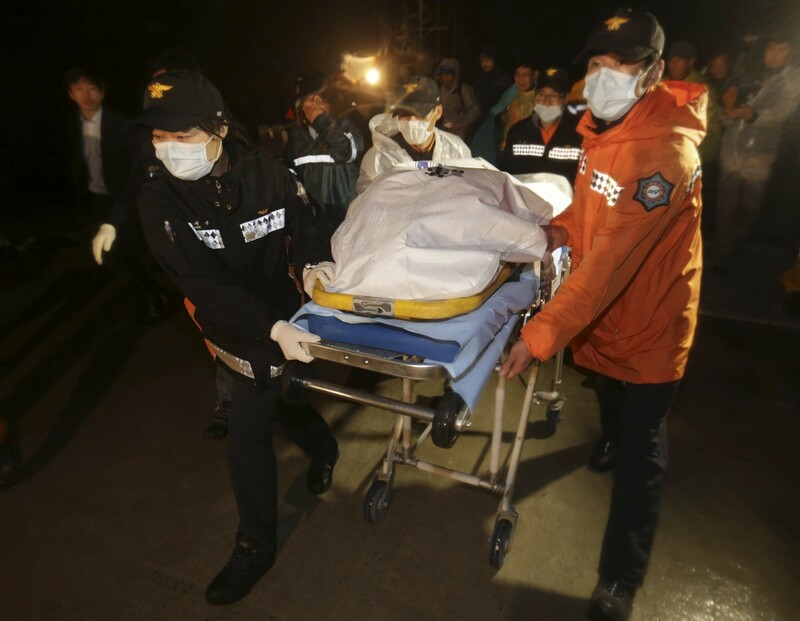 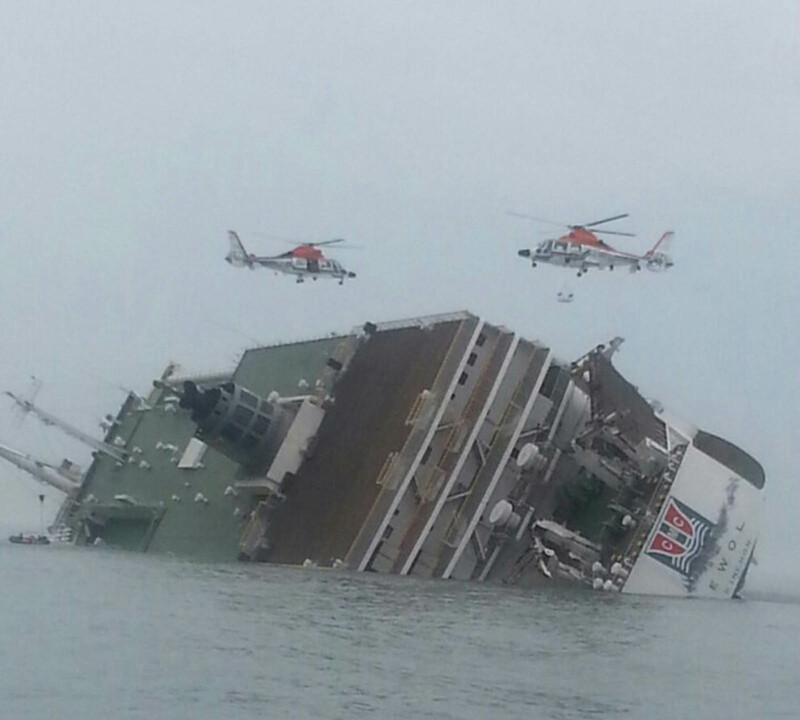 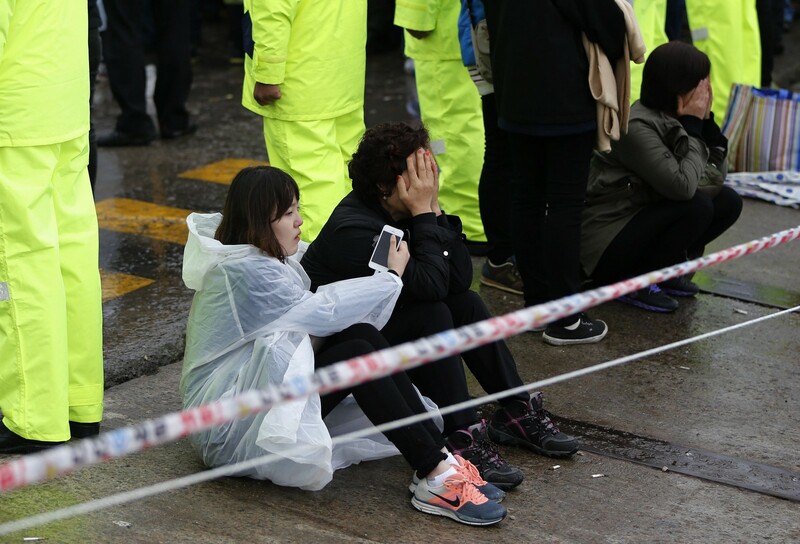 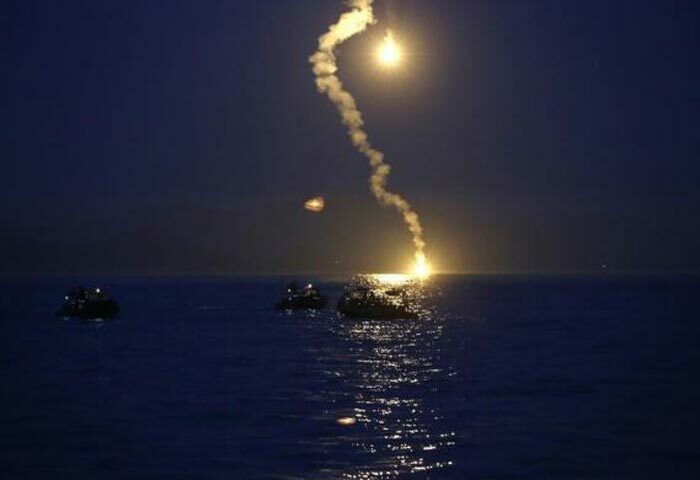 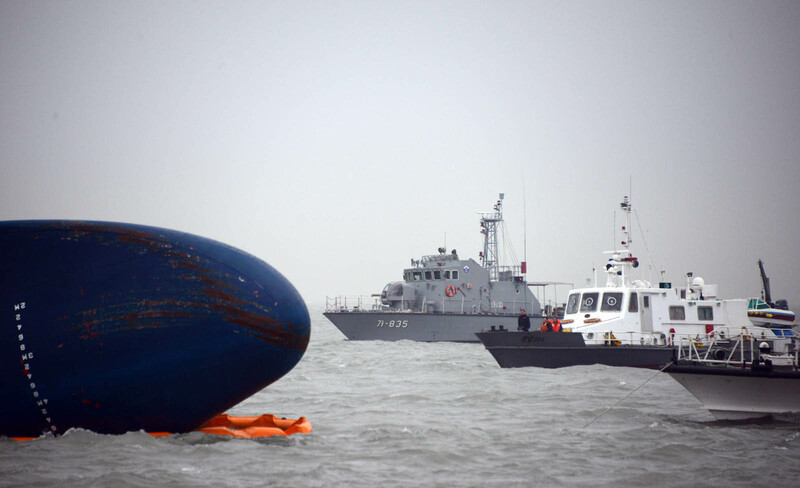 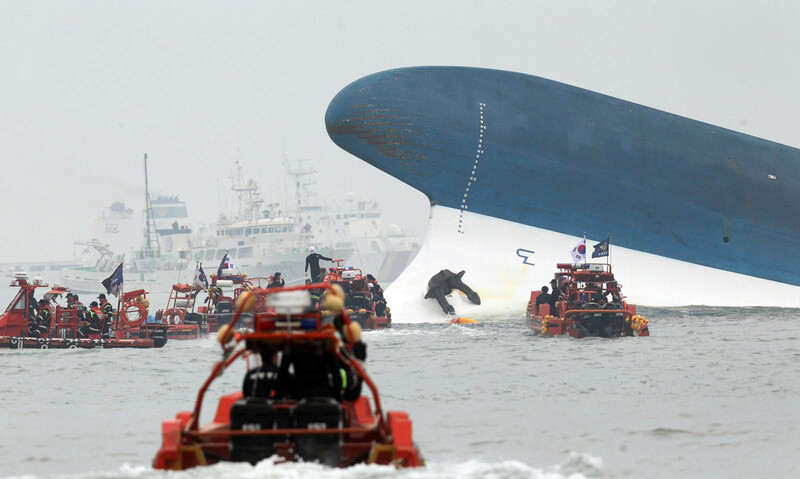 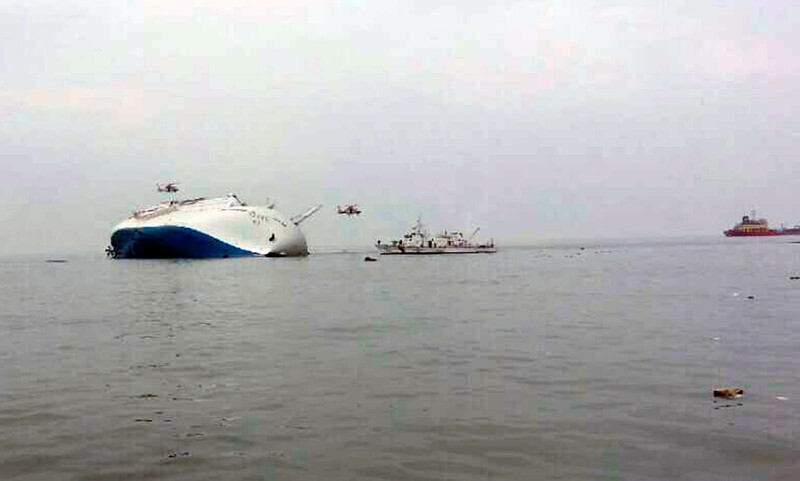 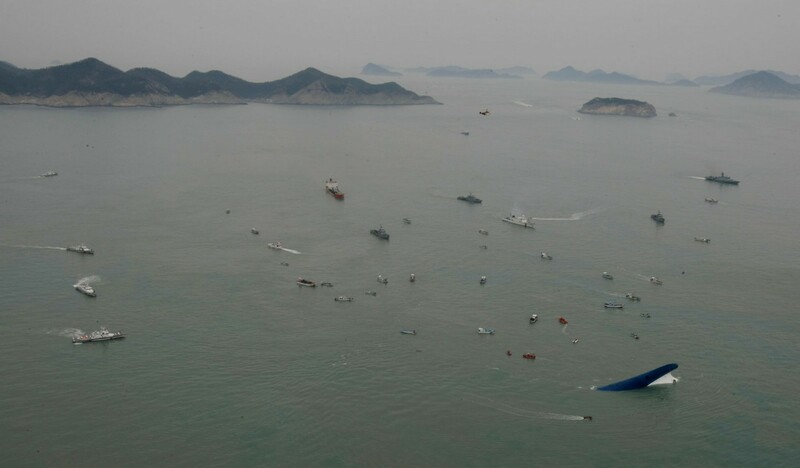 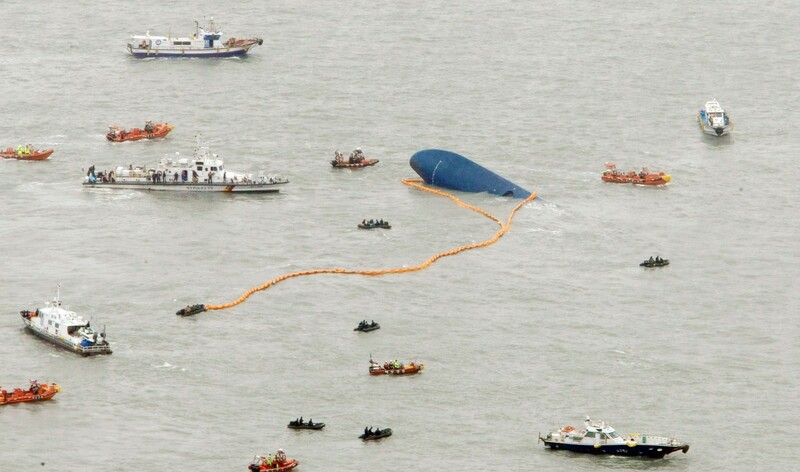 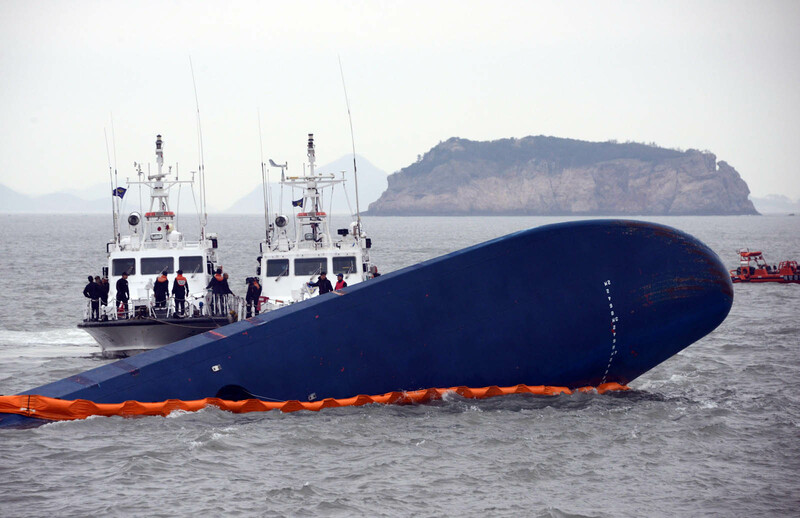 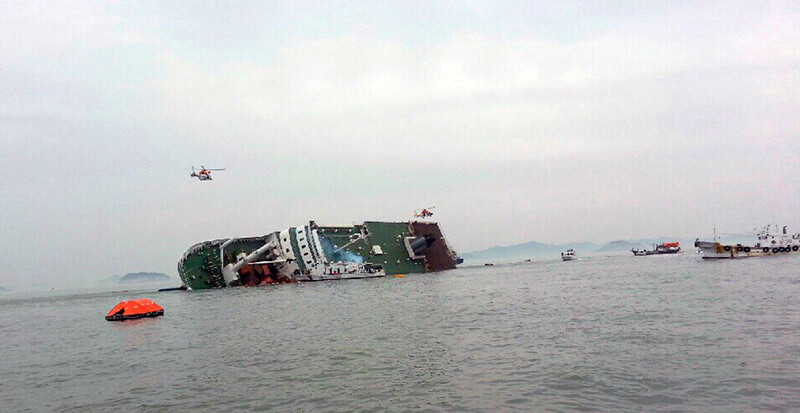 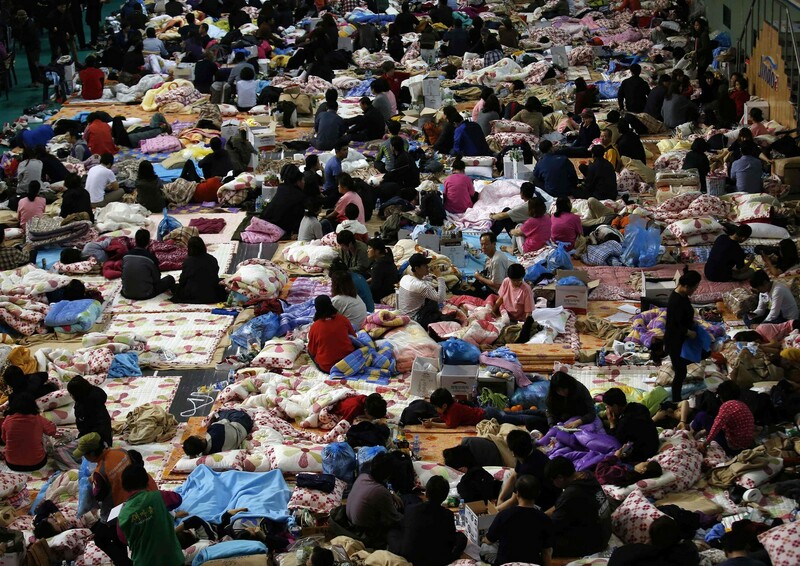 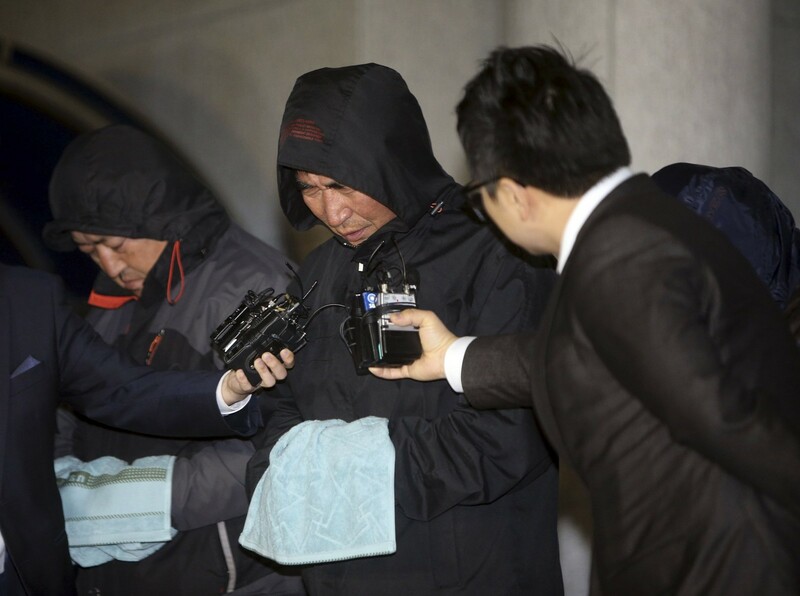 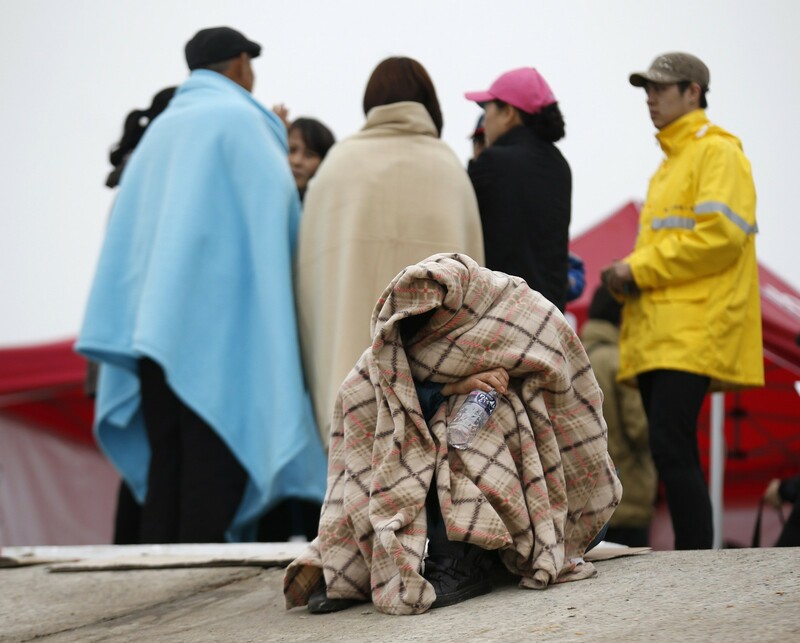 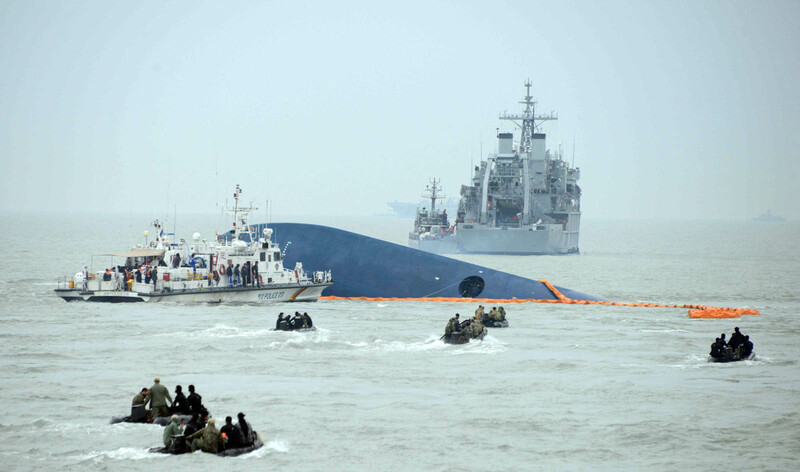 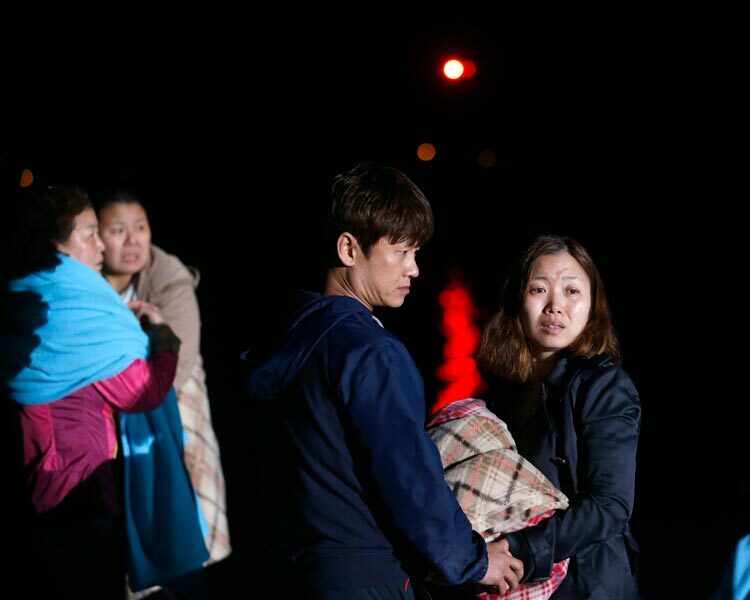 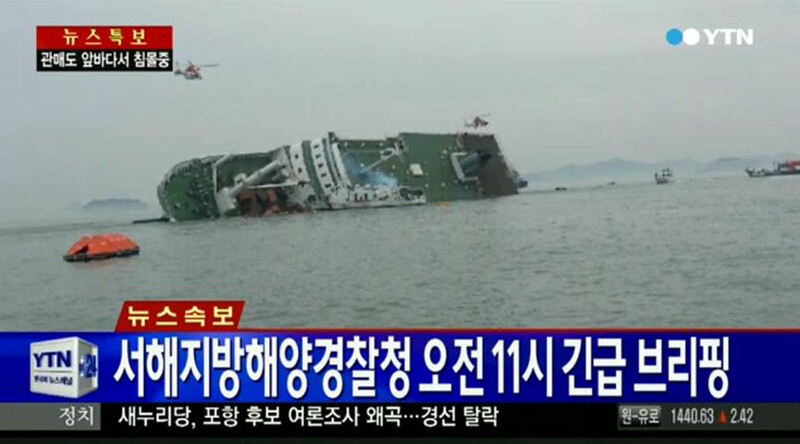 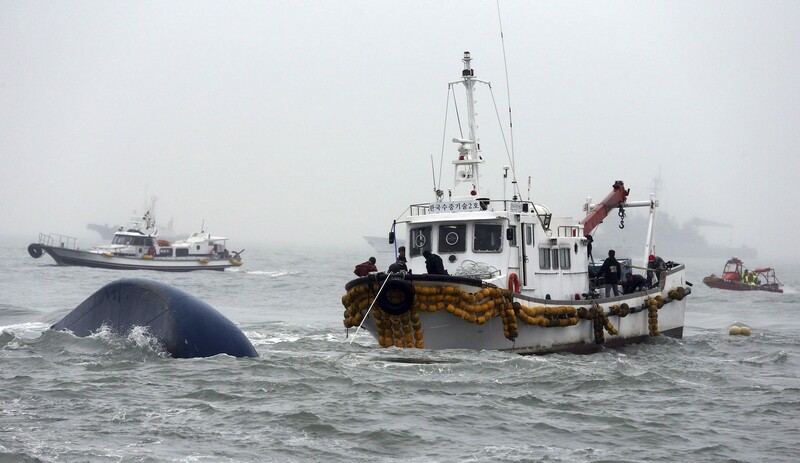 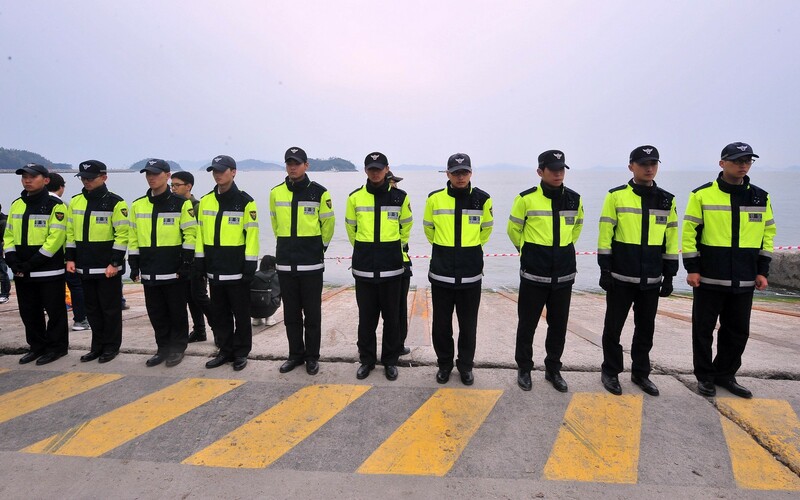 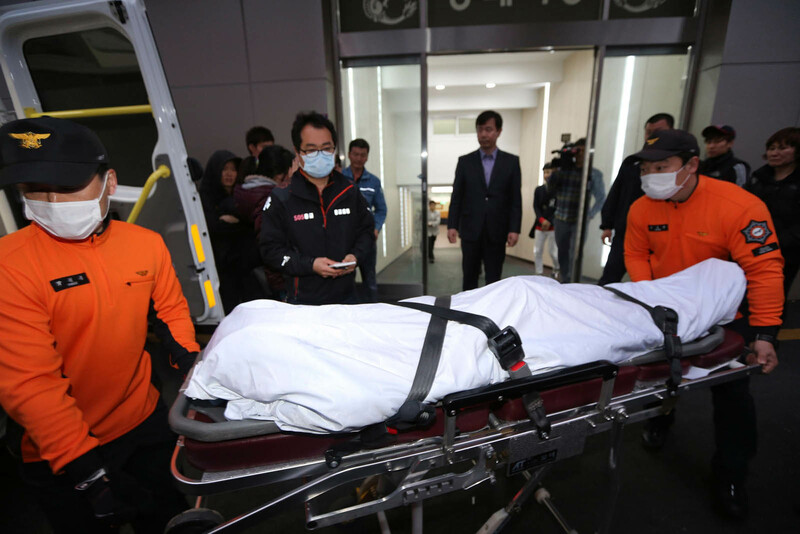 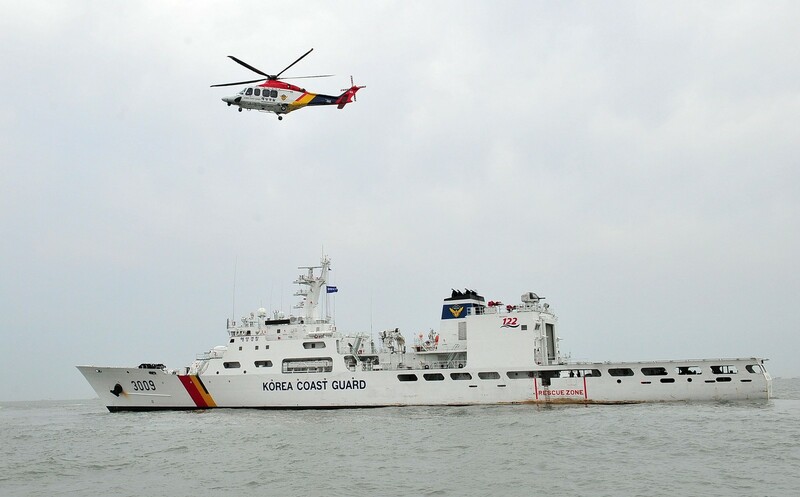 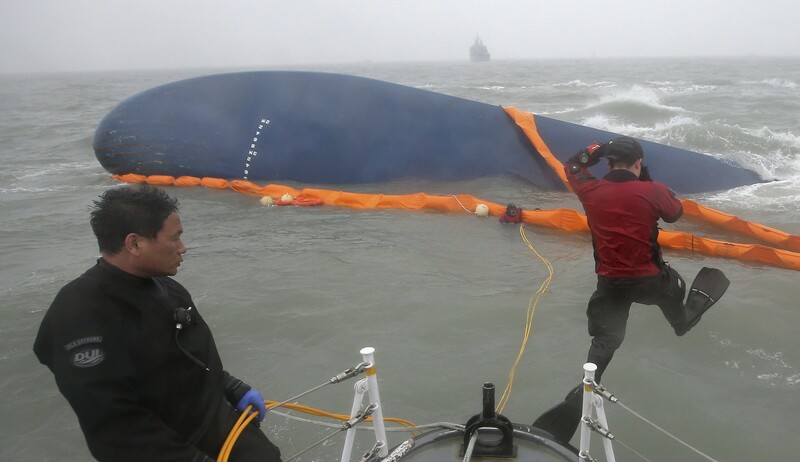 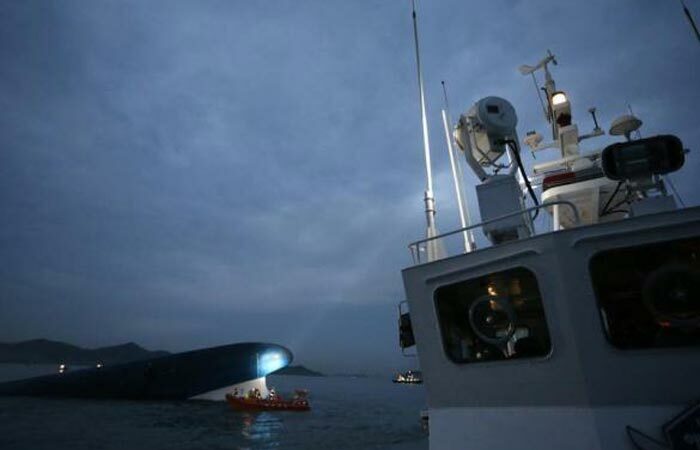 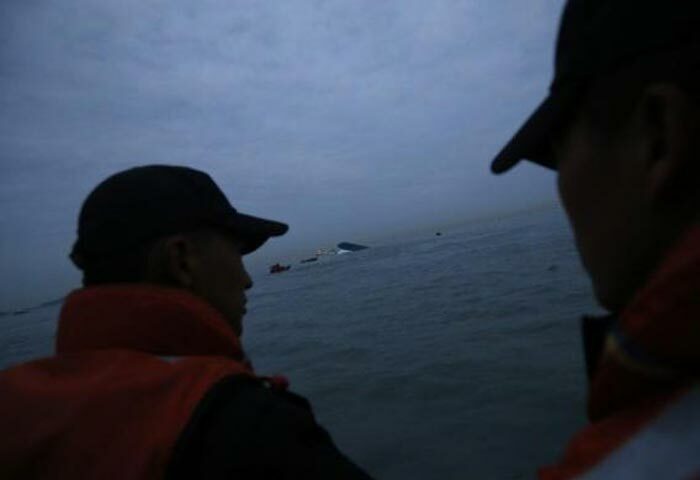 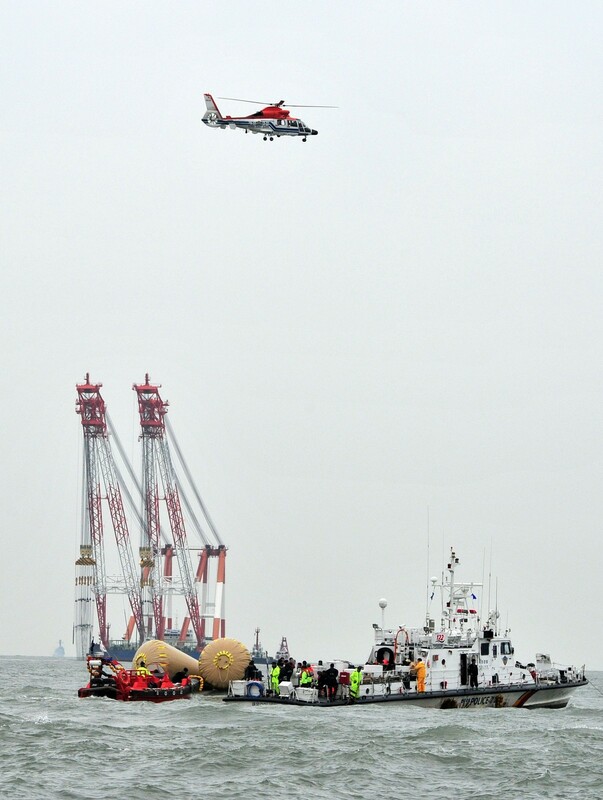 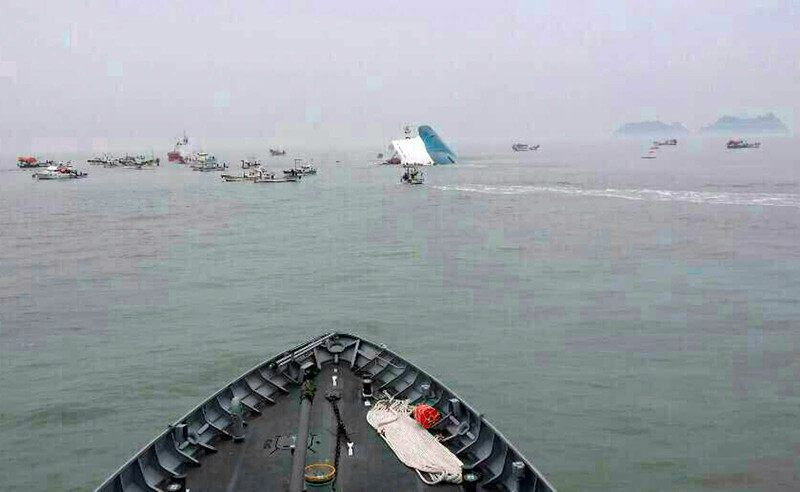 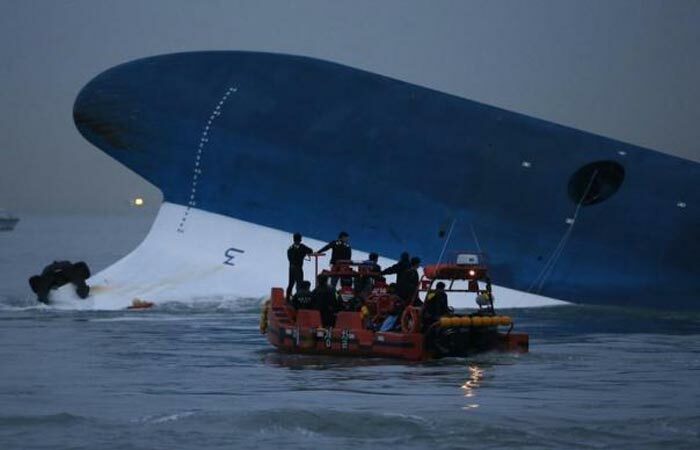 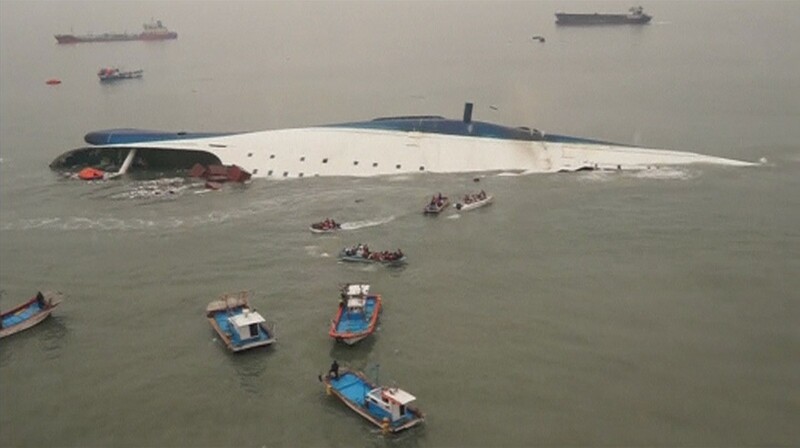 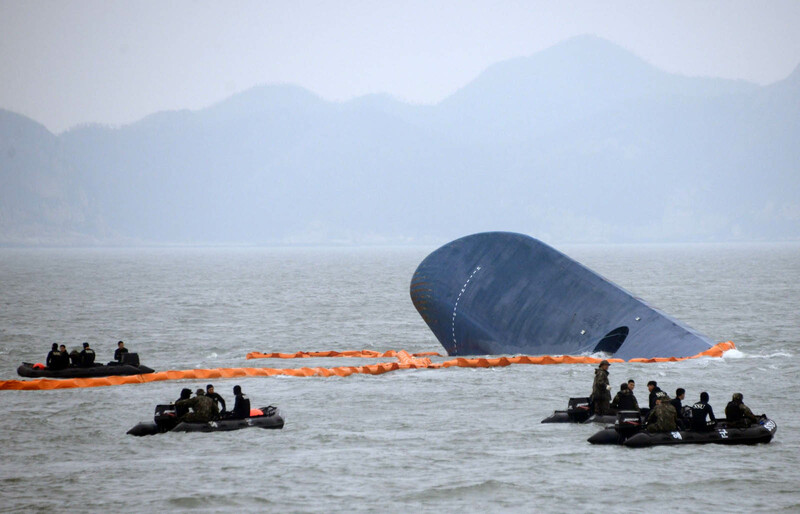 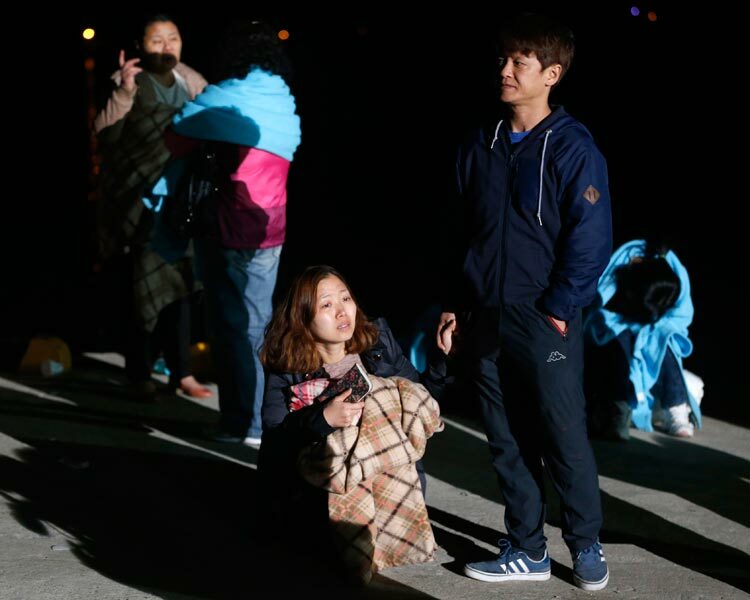 The Yonhap news agency cited rescue agency officials as saying 130 passengers had already been taken off the stricken ferry, which ran into trouble 20 kilometres off the southern coast. 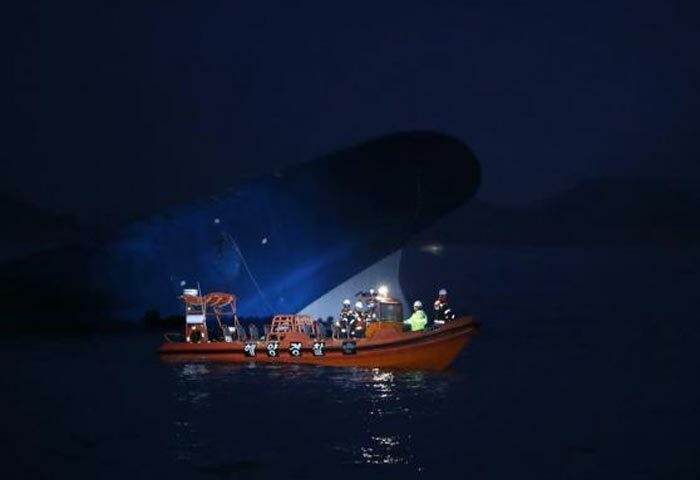 "We heard a big thumping sound and the boat stopped," one passenger told the YTN news channel by telephone. 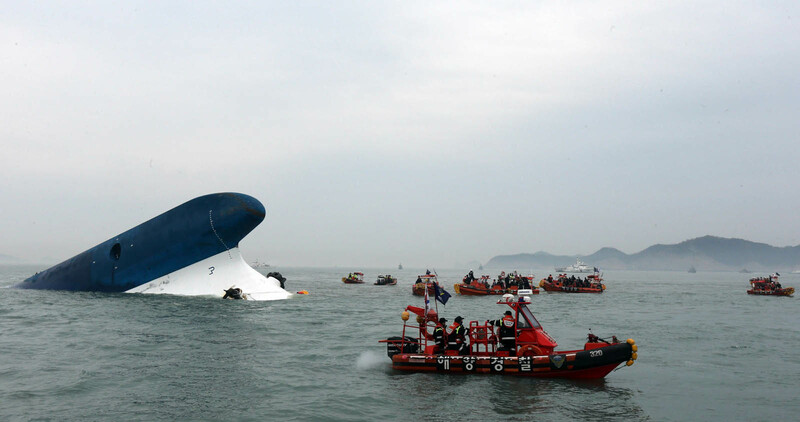 "The boat is tilting and we have to hold on to something to stay seated," the passenger said. 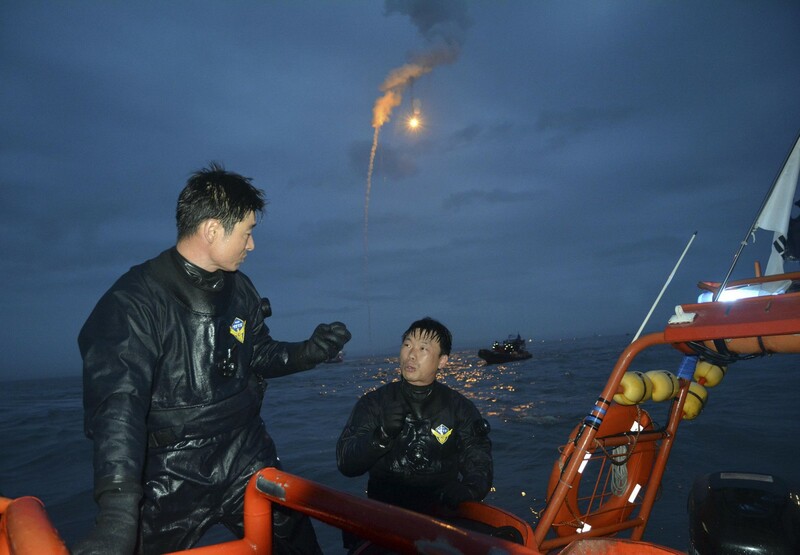 Maritime police search for missing passenger as lighting flares are released for a night search. 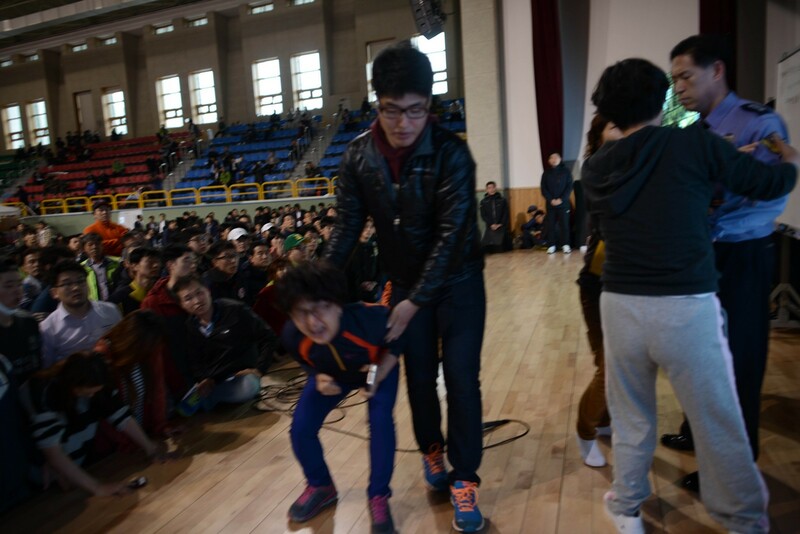 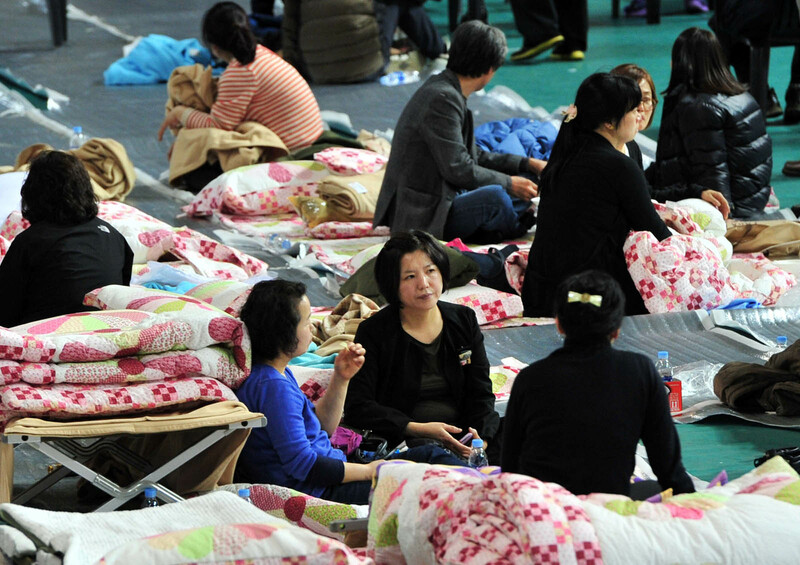 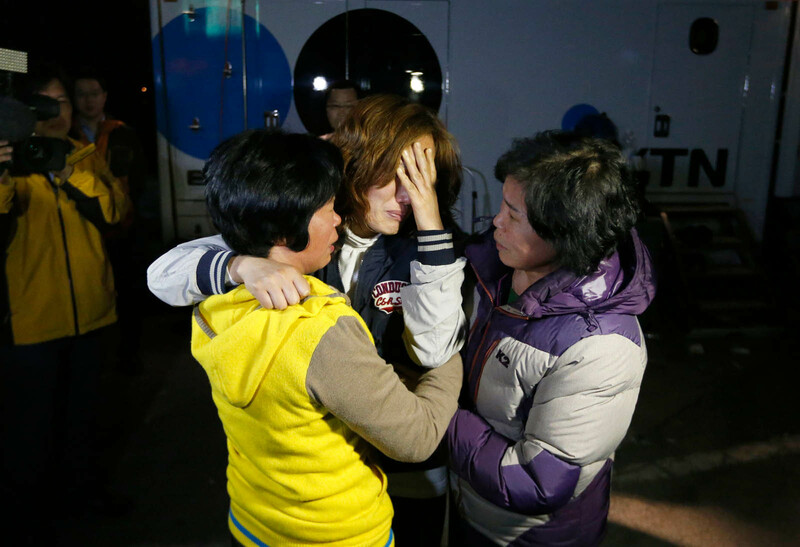 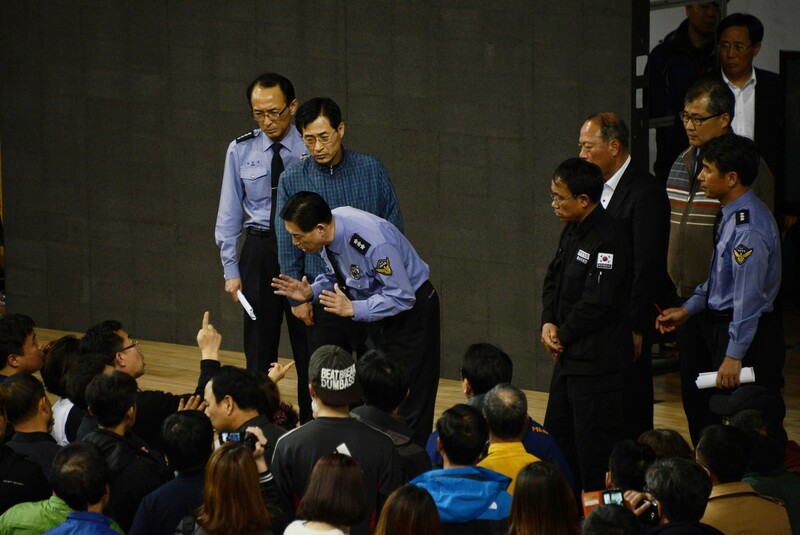 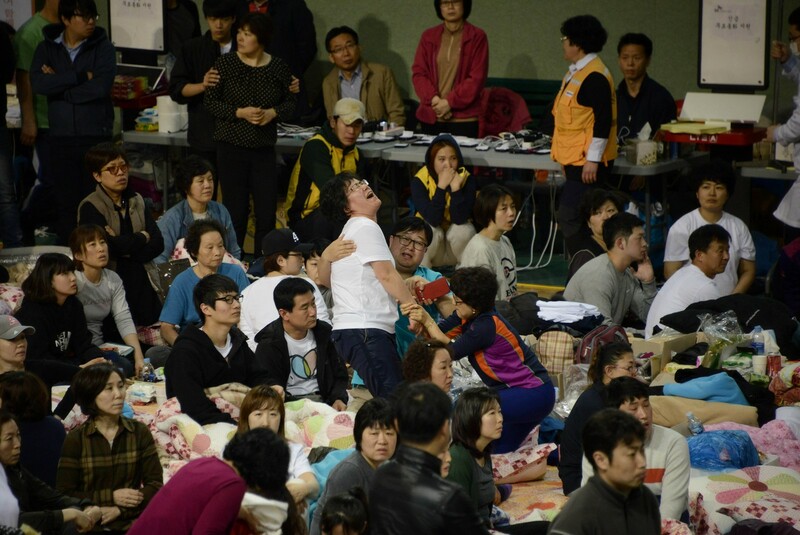 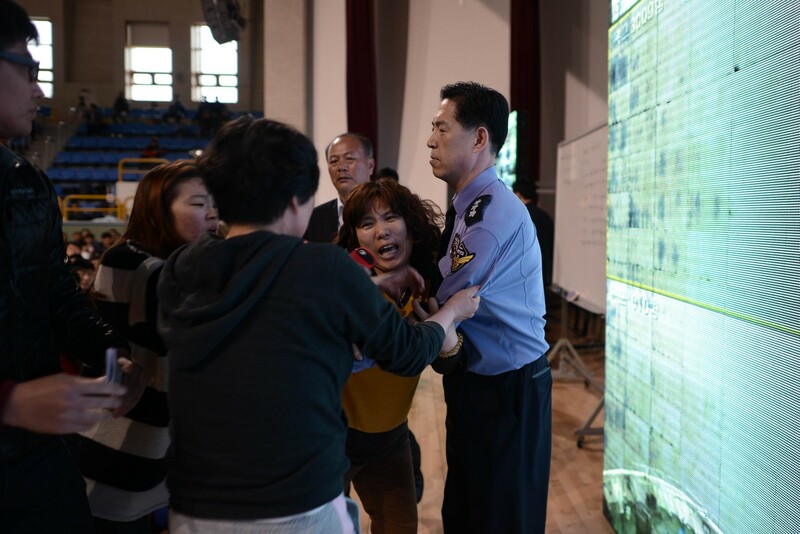 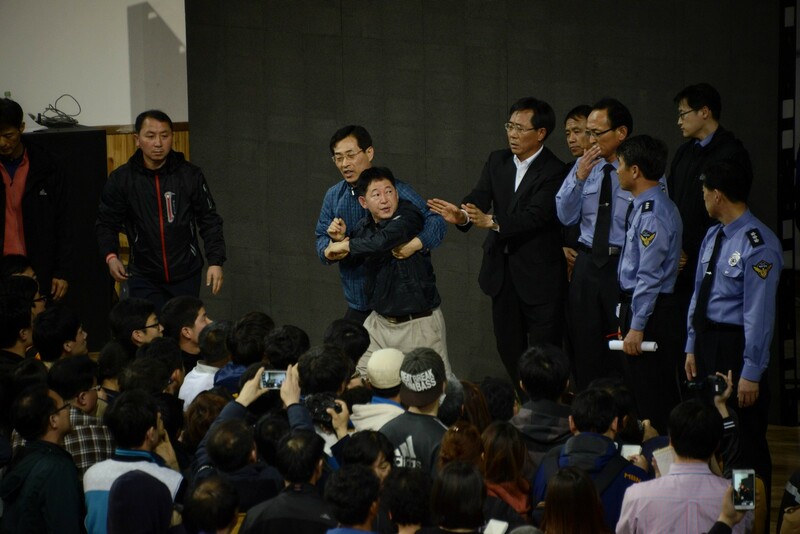 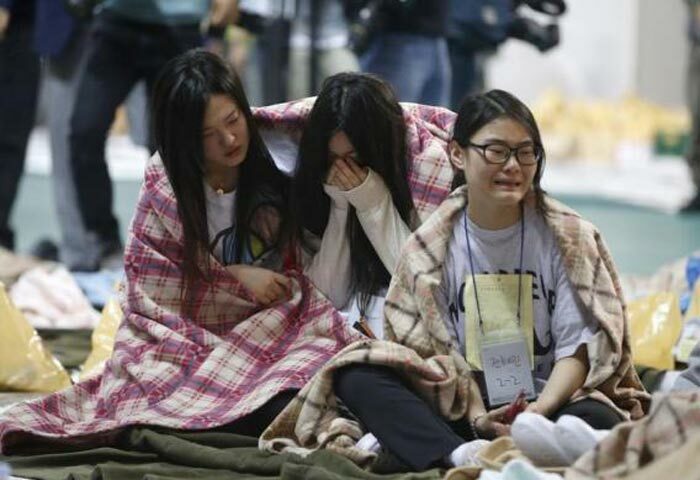 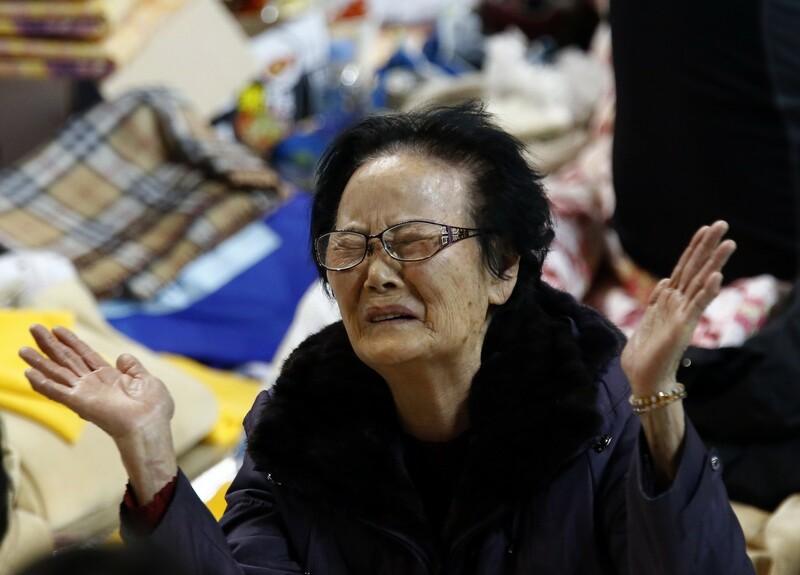 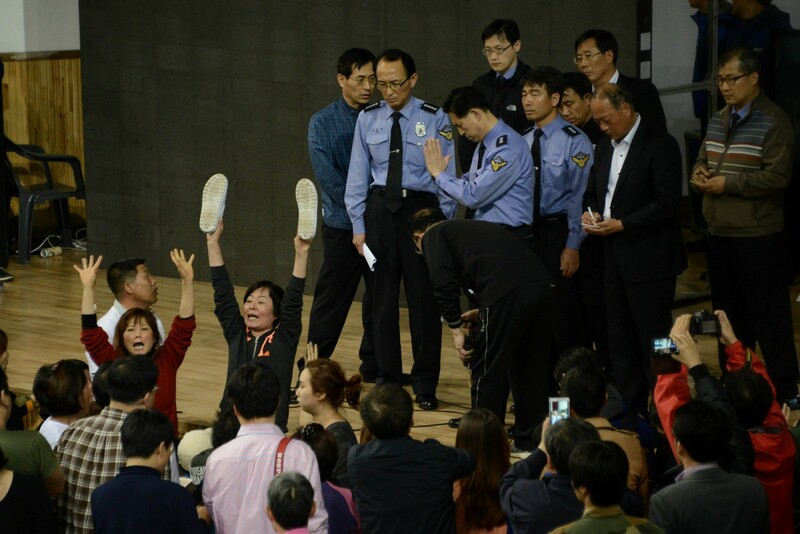 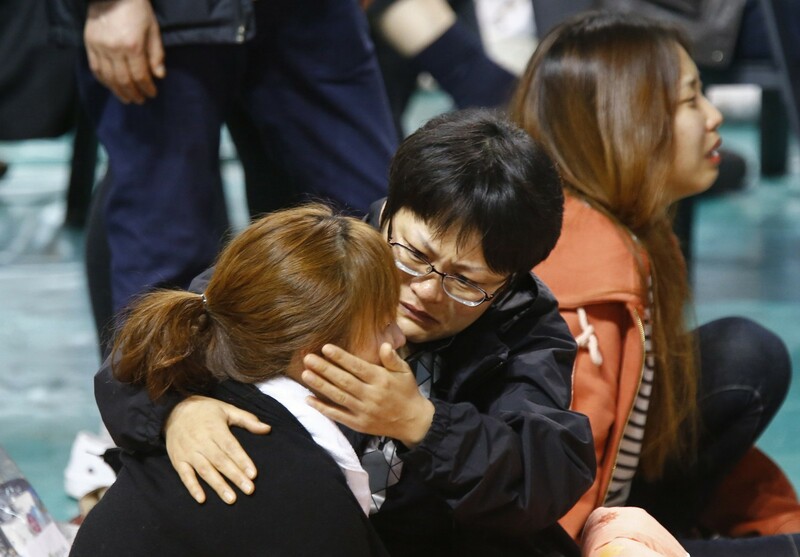 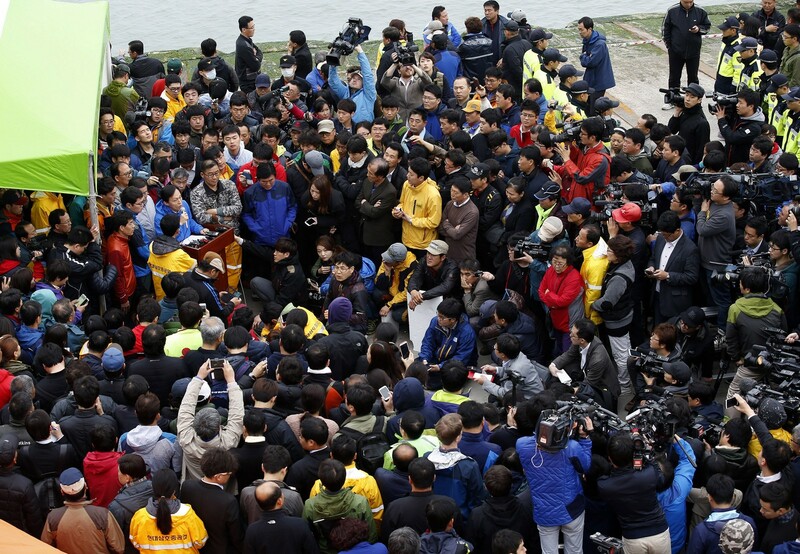 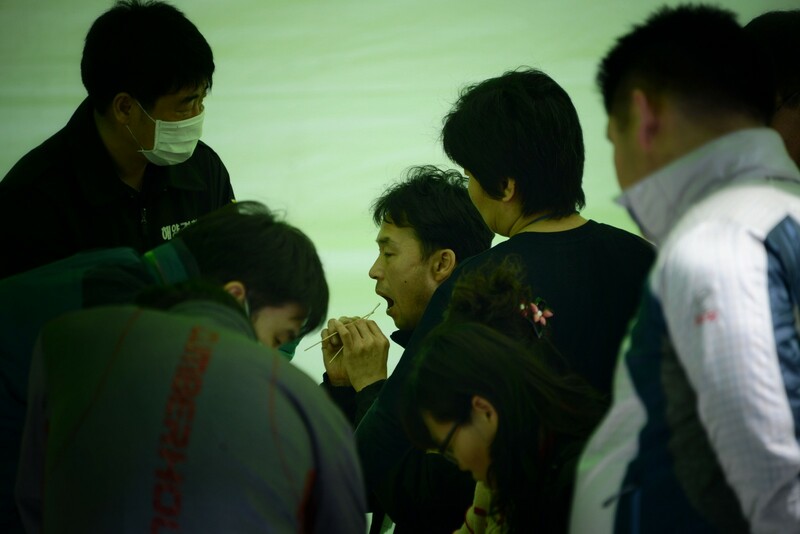 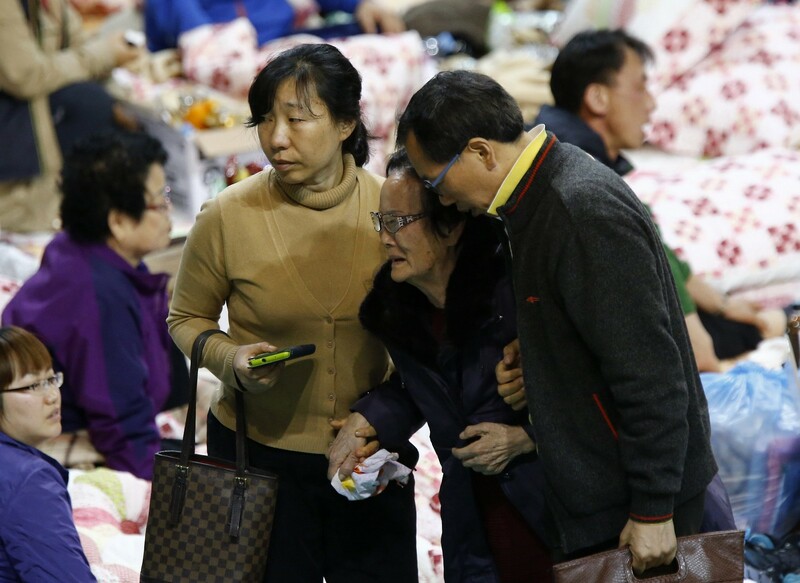 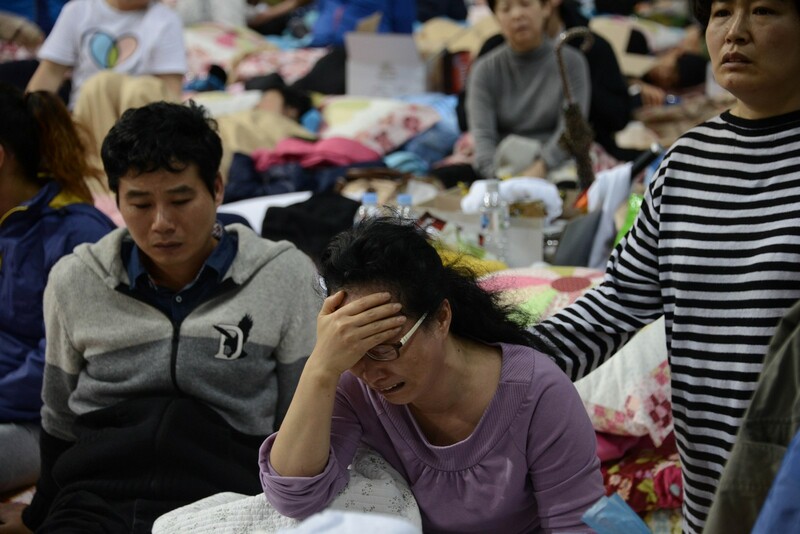 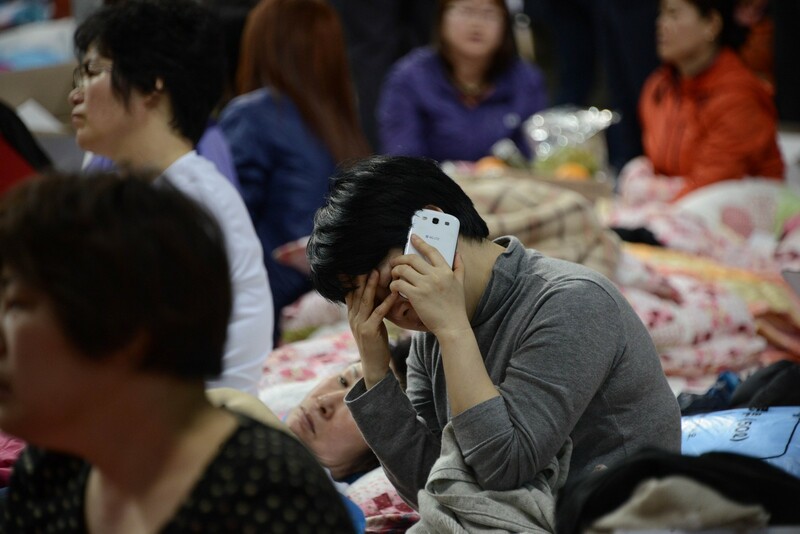 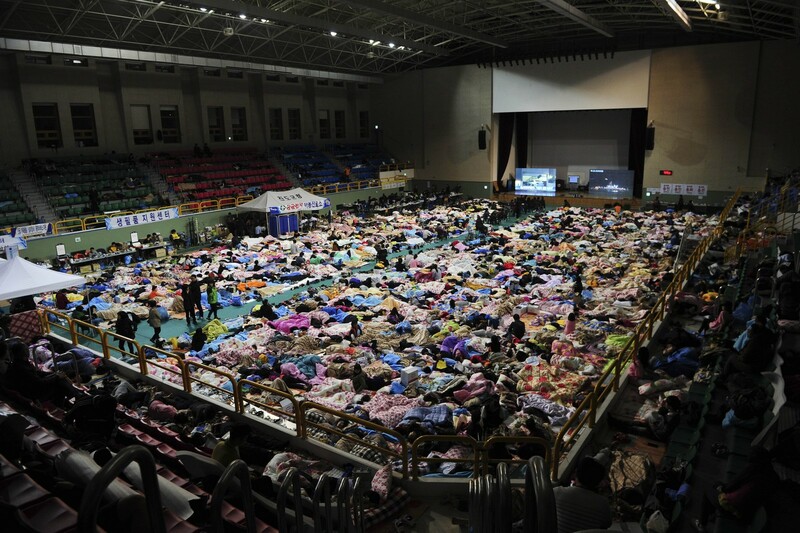 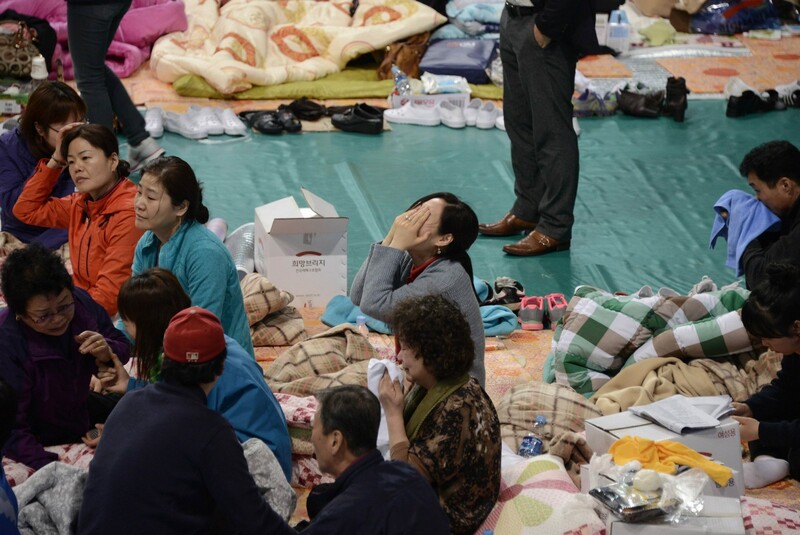 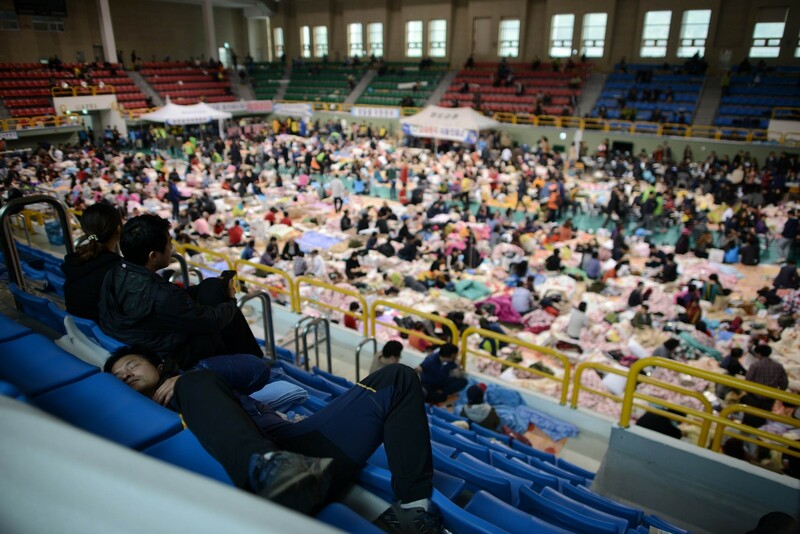 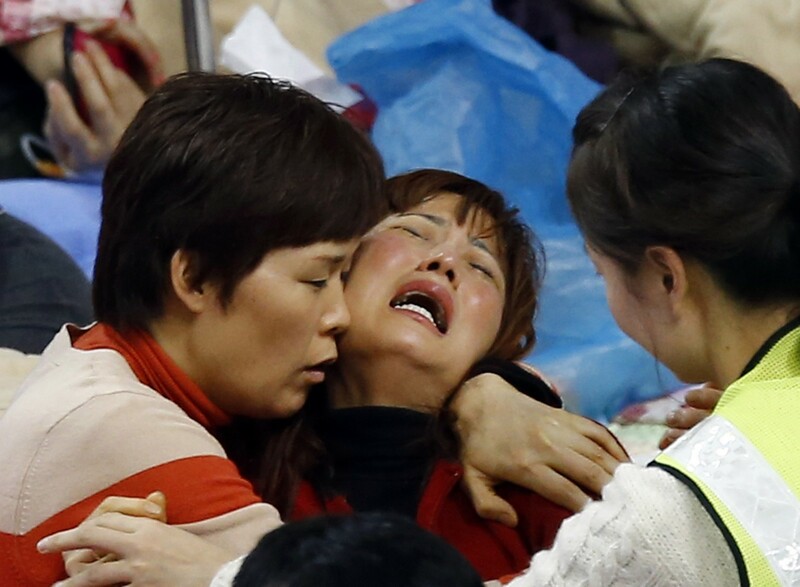 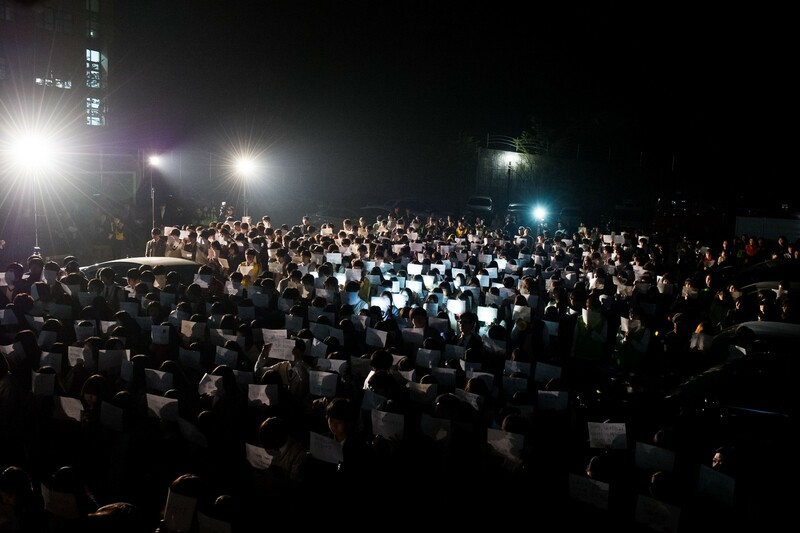 Rescued passengers cry at a gym where rescued passengers gather in Jindo April 16, 2014. 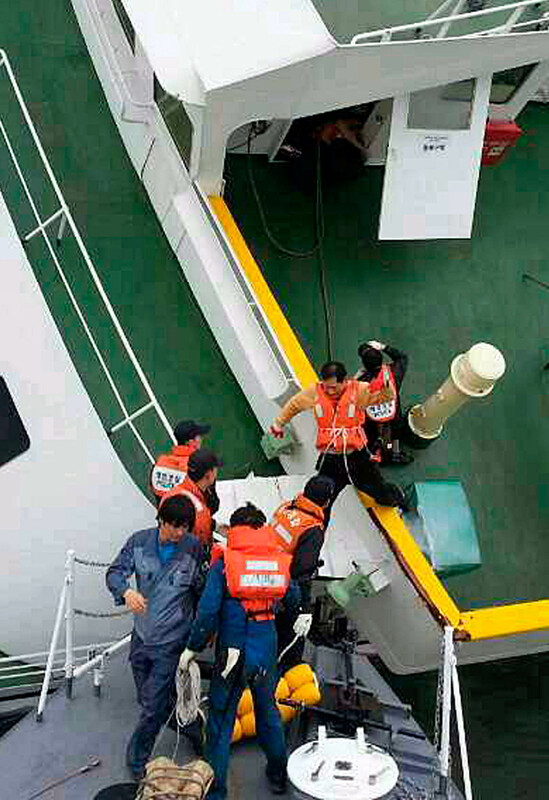 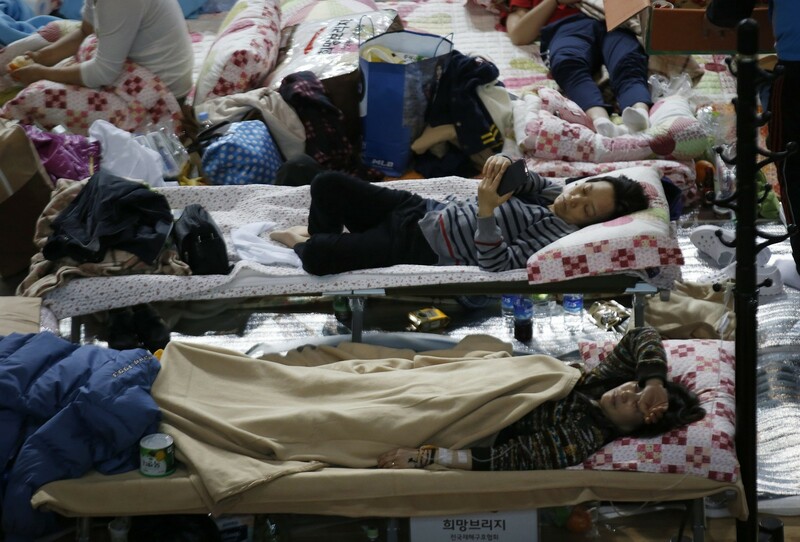 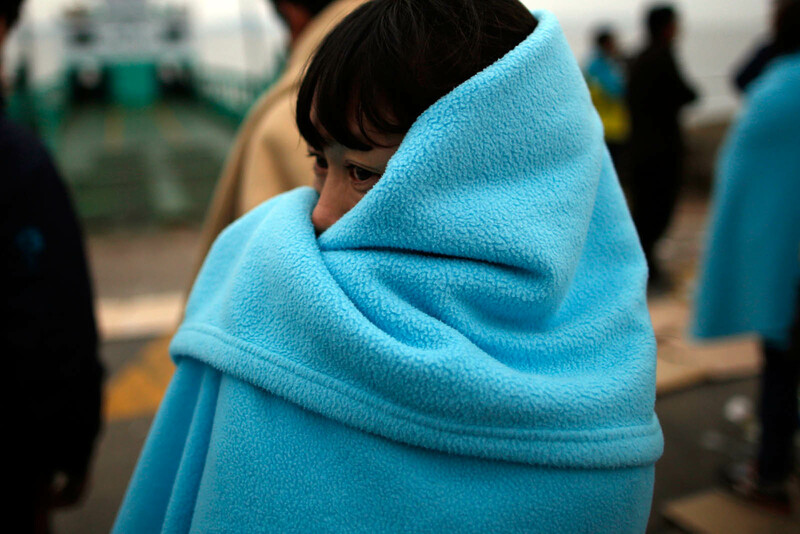 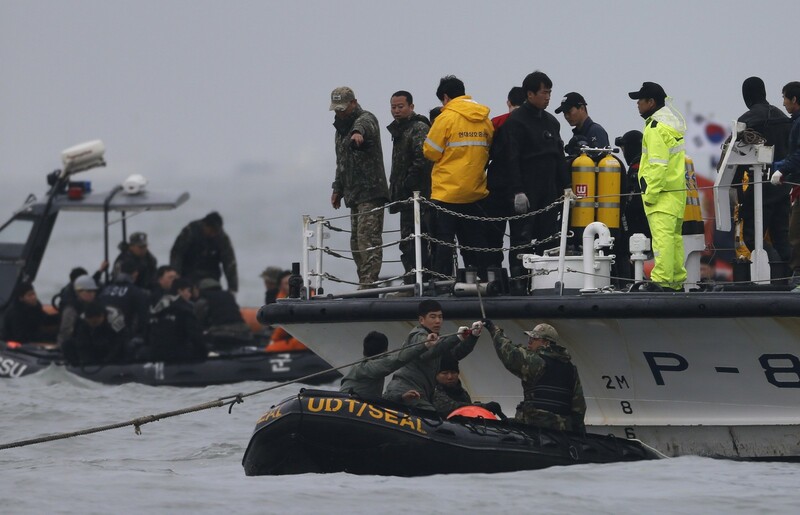 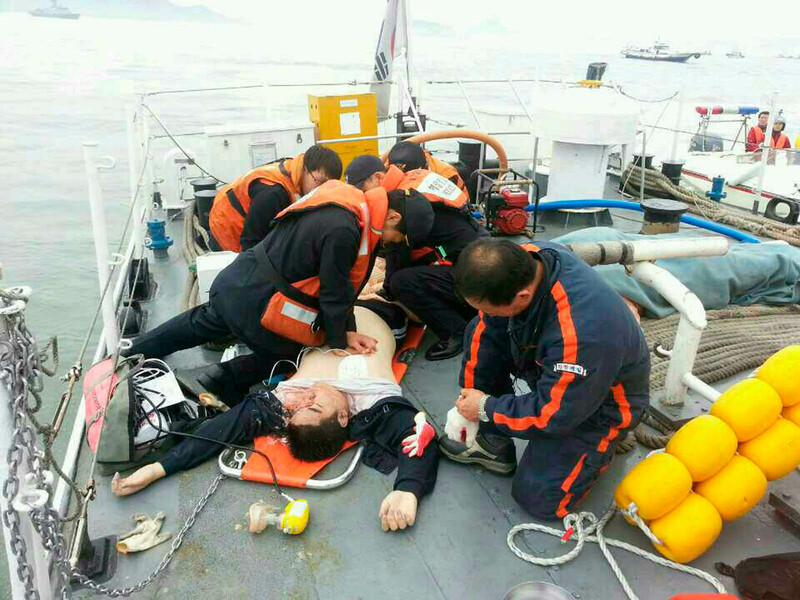 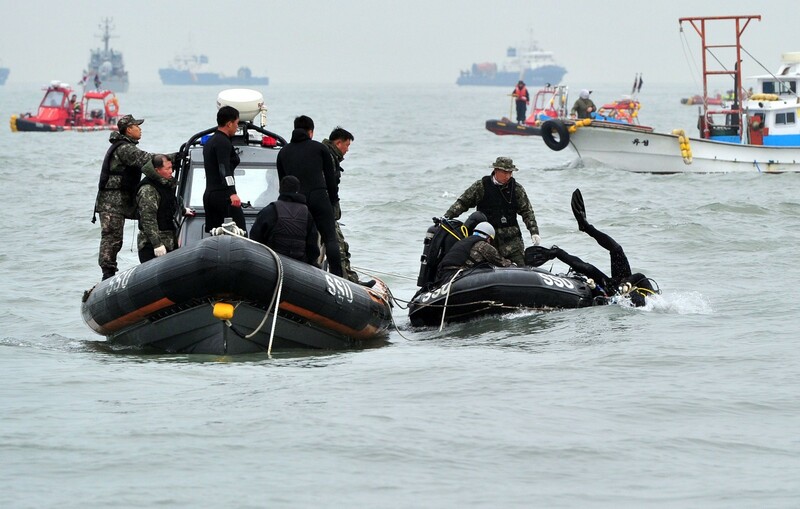 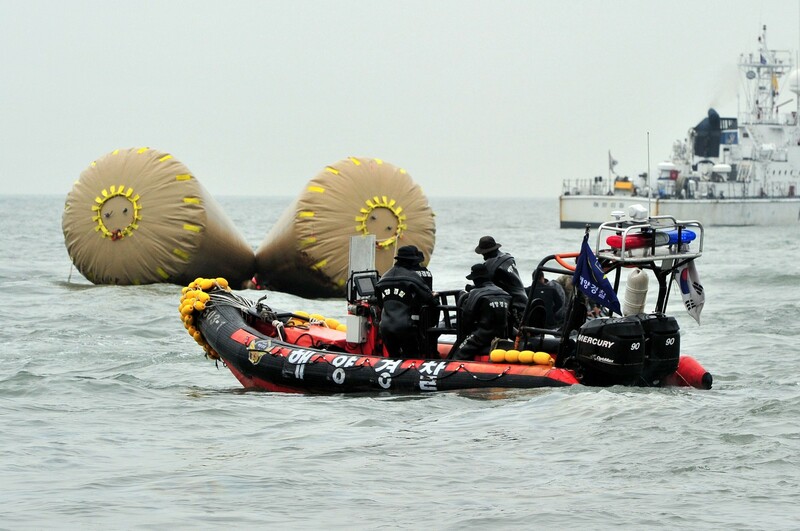 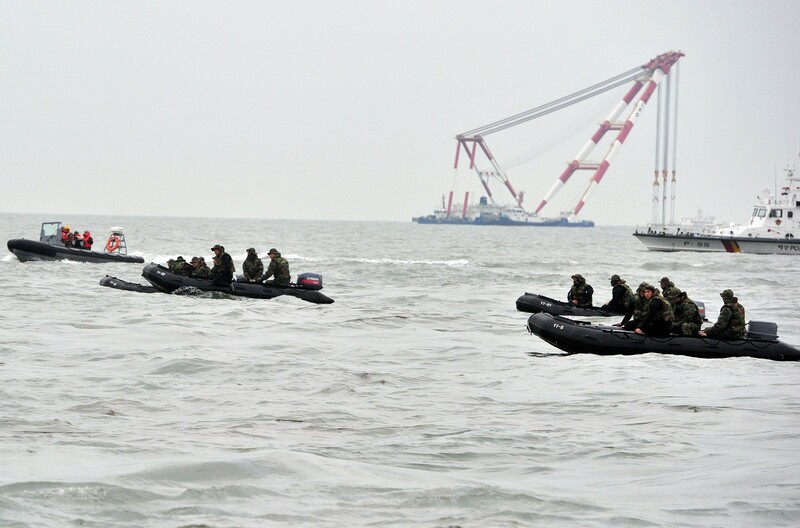 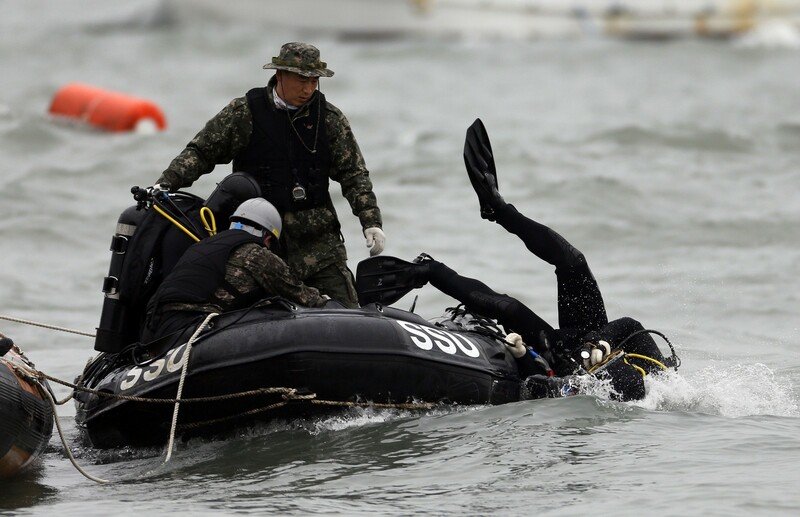 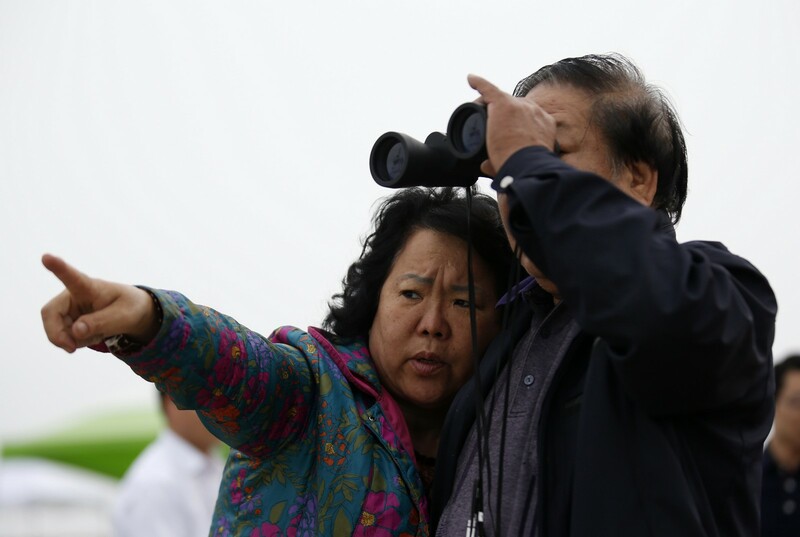 Maritime police search for missing passengers in front of the South Korean ferry "Sewol". 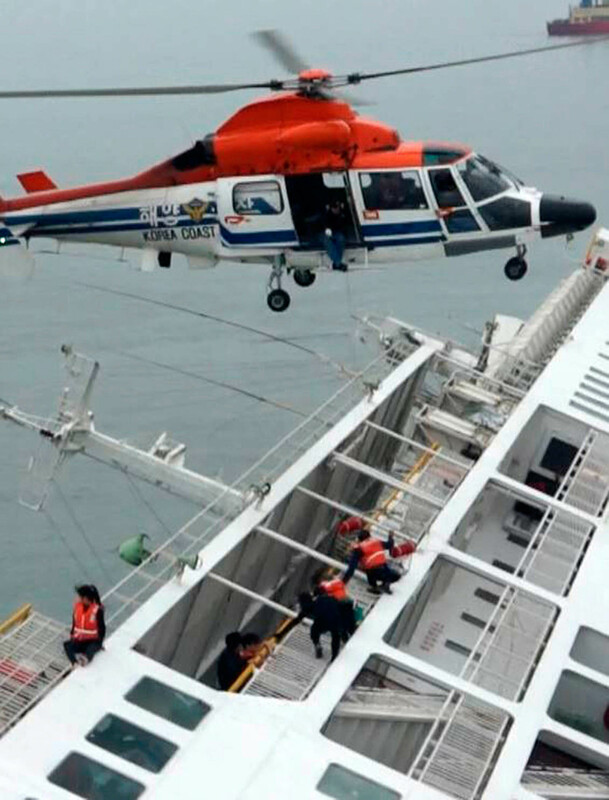 Mother of a passenger on the ferry. 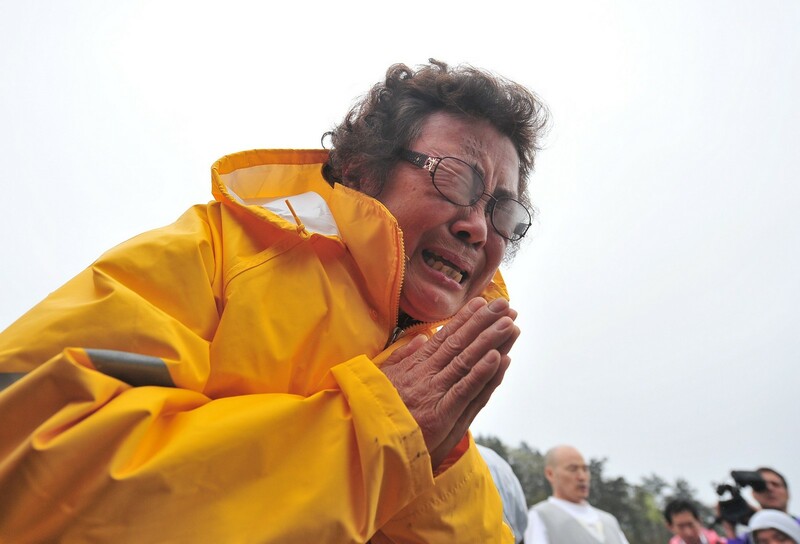 A mother of a passenger onboard the ferry. 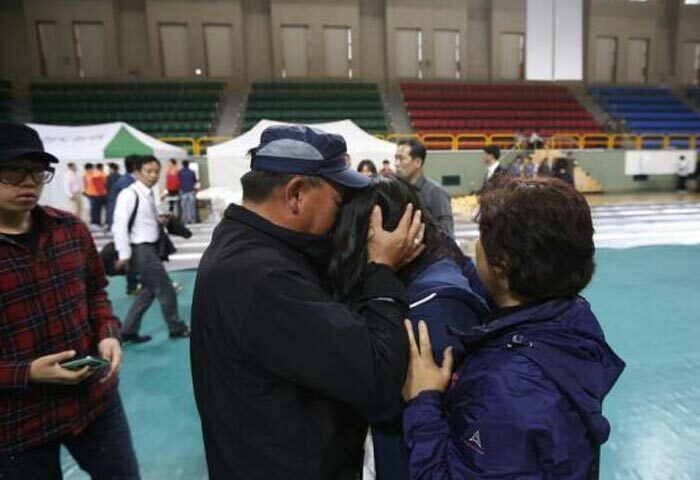 A father hugs his rescued daughter. 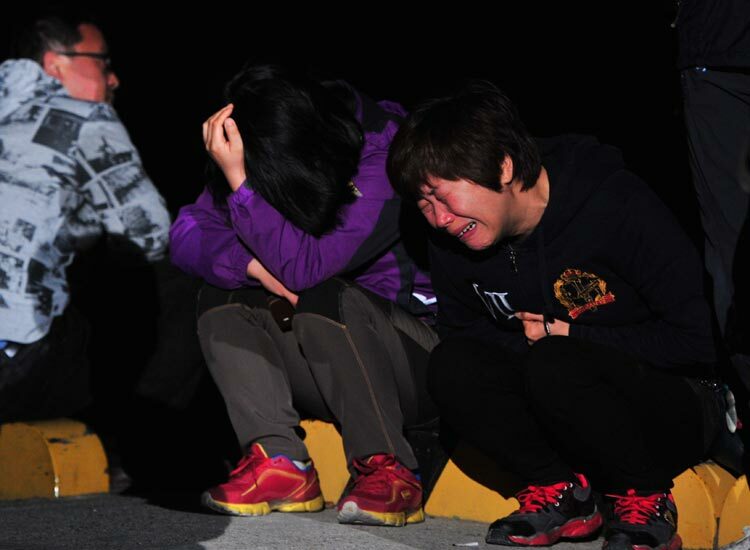 Family members of missing passengers. 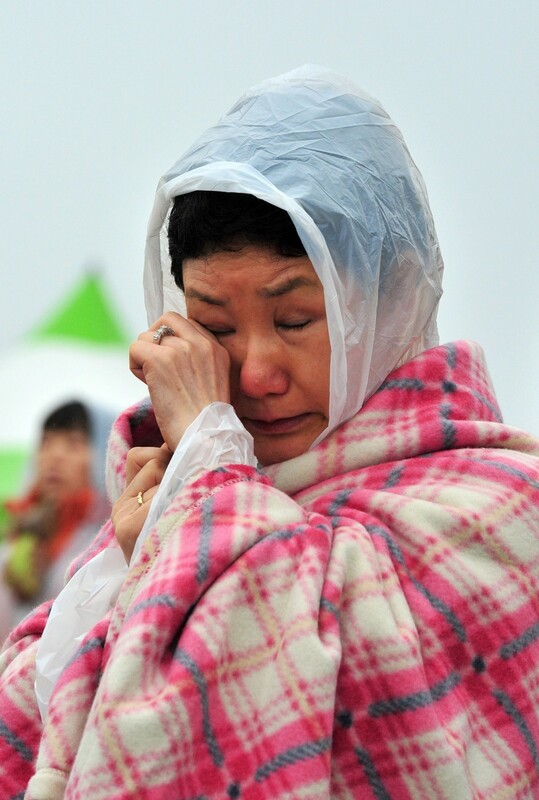 A family member of a missing passenger.